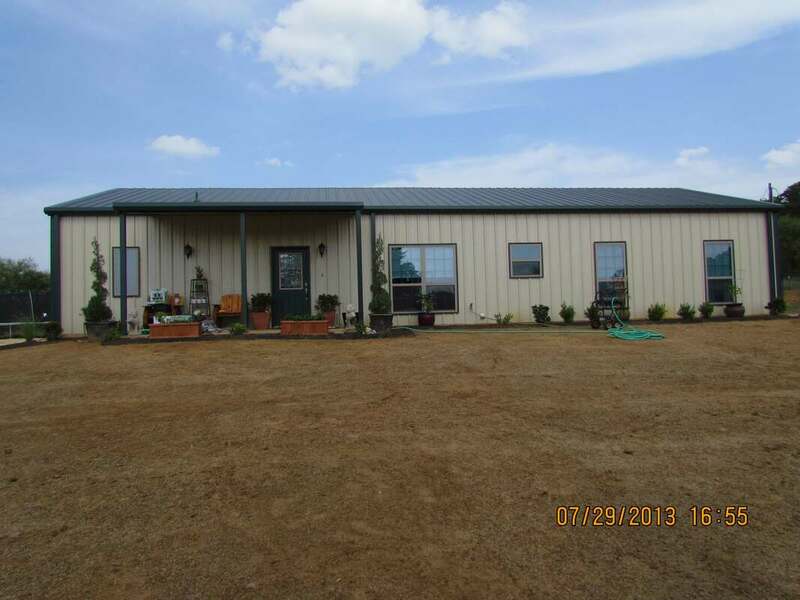 We're often asked questions about our metal building house. When people see it they typically either say they've heard of a barndominium but didn't know exactly what it was, or that they've always wanted to build something like that. ​With a barndominium home the floor plan options are endless and other cool ideas like including a workshop, or even an indoor half court basketball area is what the fun of barndominiums is all about. 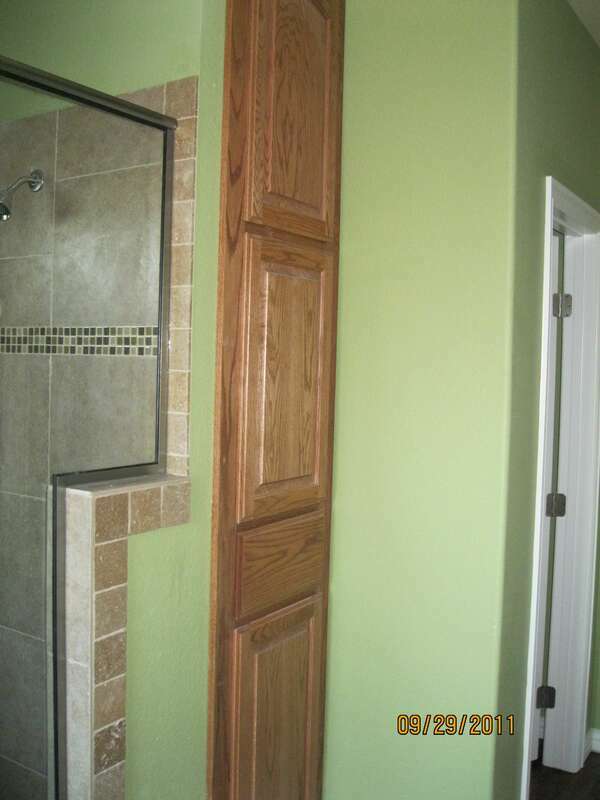 Whatever your budget can afford, and your imagination can conjure, is likely possible in your design and construction. Besides being extremely energy efficient when well insulated, barndominium homes offer very low maintenance living. 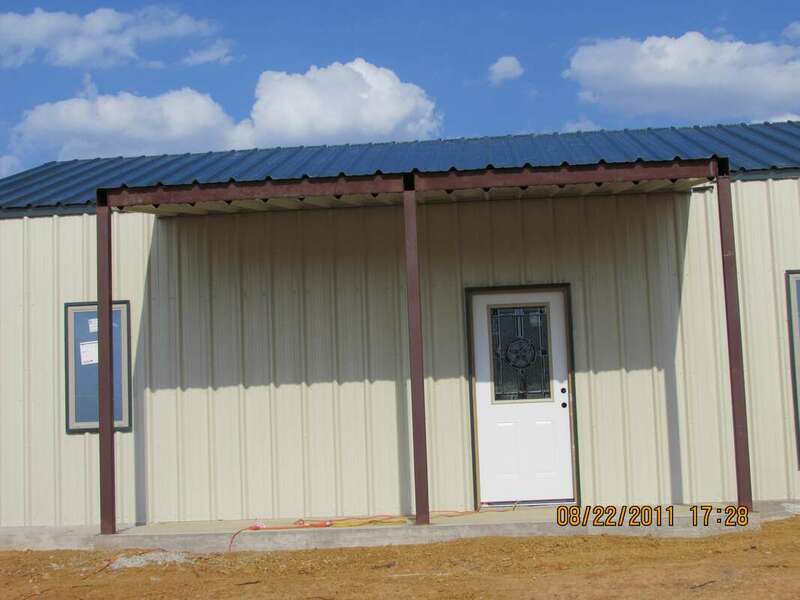 A properly constructed metal building home also offers well above average resistance to natures elements. 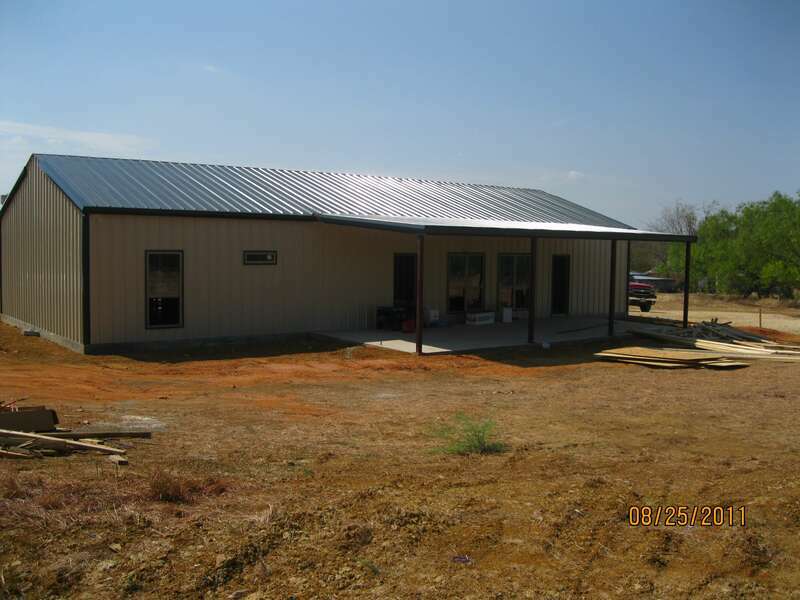 The metal roofs resistance to small and medium size hail is great and the structure can withstand very high winds. 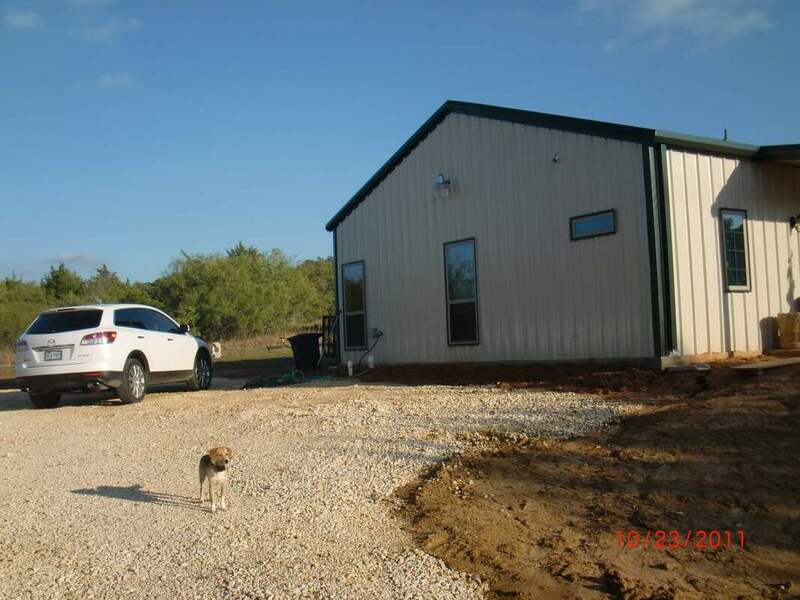 ​How to build a barndominium metal building house was the first question I had to answer when we decided it was what we were doing for our new homestead. There was a lot to figure out along the way. 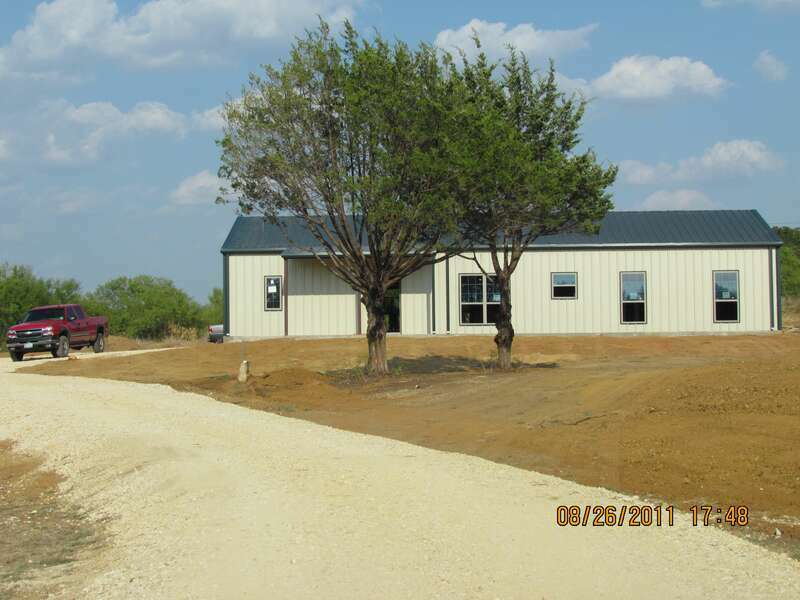 The cost of construction for our metal building barndominium home in 2011 was $100,000. 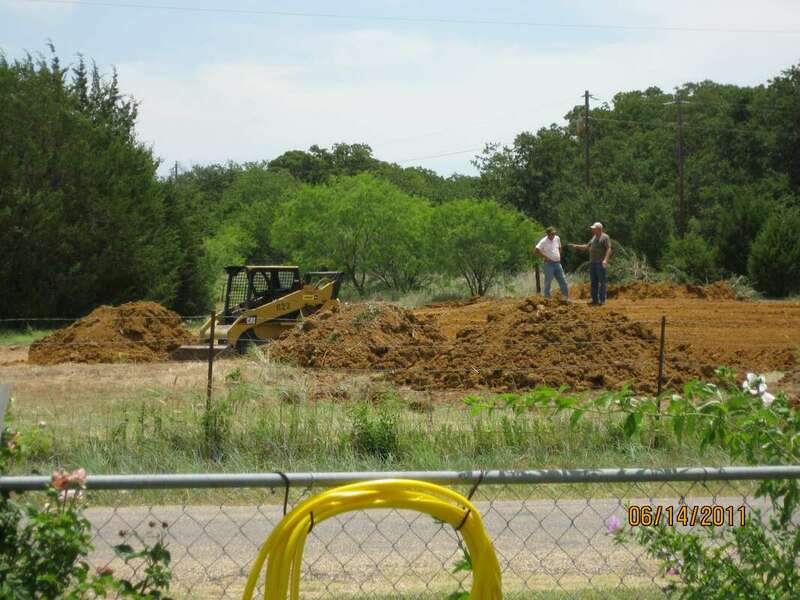 That cost is strictly the foundation up for the home construction and doesn't include excavation, septic sewer, or any utility connections. That total includes every cost related directly the homes construction, such as plan design service, county building permit, etc. Considering it is 2,000 square feet of interior living space, the cost per square foot was $50. 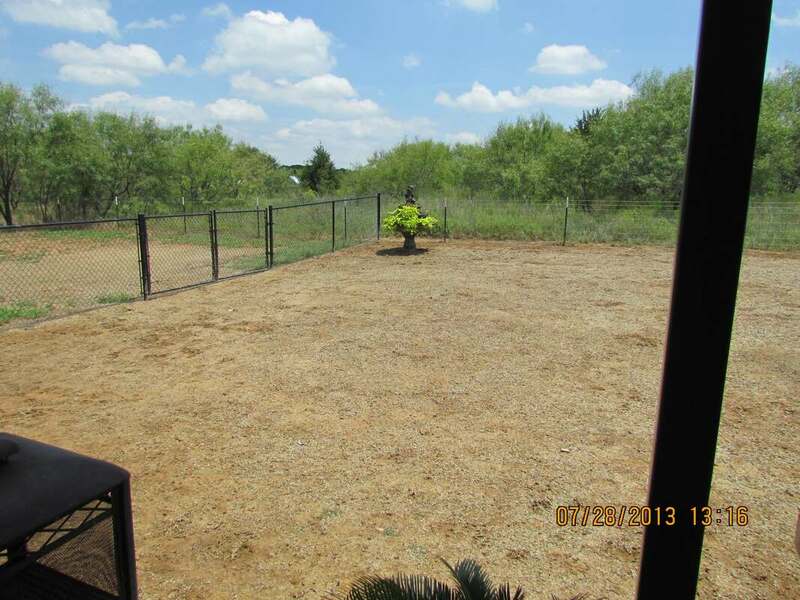 There is also 682 square feet of covered porch and patio included in those numbers. The large back patio was a necessity for our love of outdoor cooking and plants! 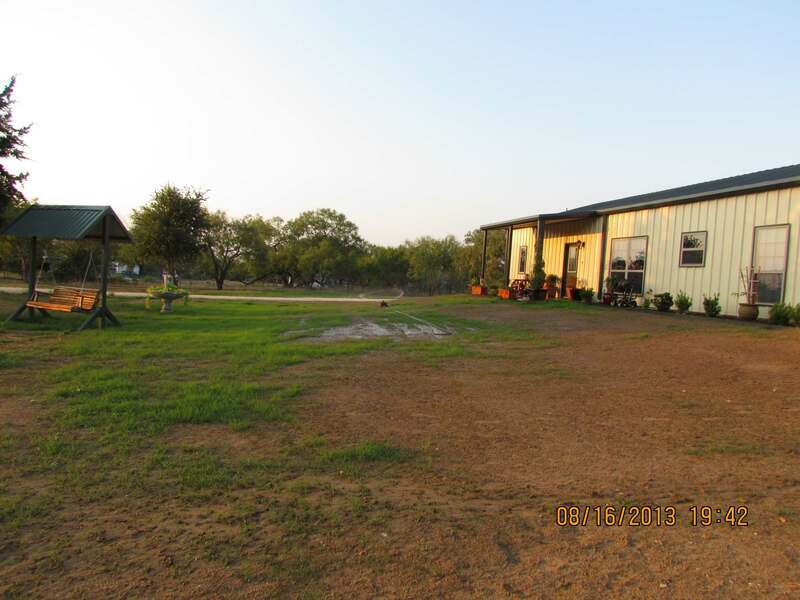 We found the perfect piece of property to Build Our Texas Barndominium House! One of the challenges you may have in selecting a barndominium metal building home build site is finding a piece of land that isn't restricted. 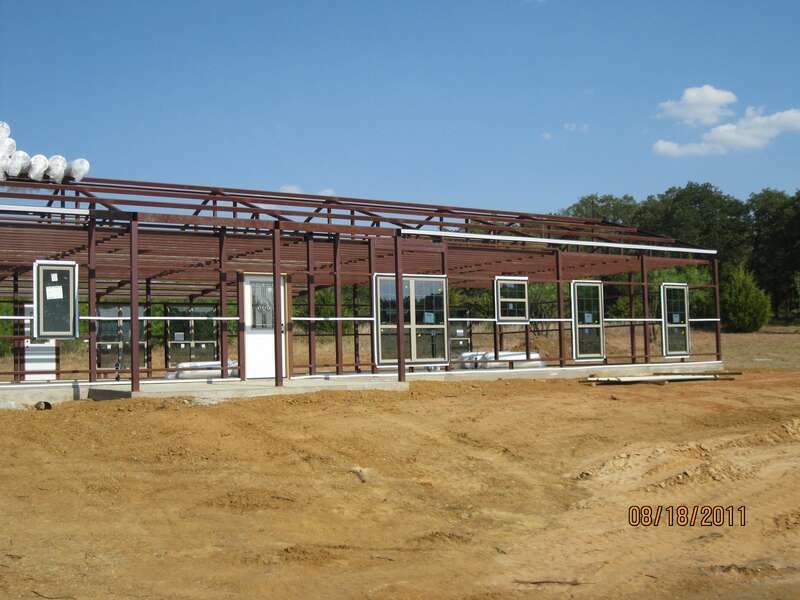 Very few municipalities (cities) have adopted ordinances that allow for the construction of steel building homes. You will more than likely need to be looking outside of city limits. 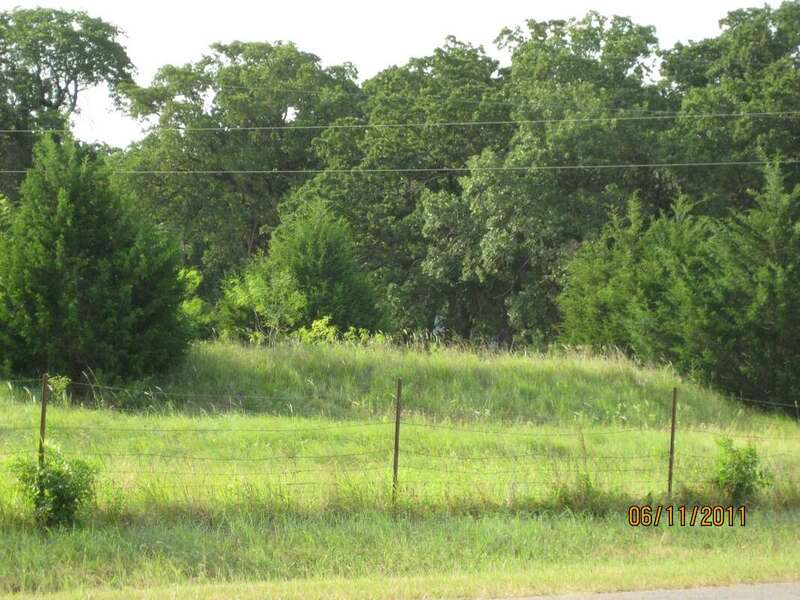 Smaller tracts of an acre or two outside of city limits, that have utilities available, aren't very easy to find. They are out there, you just have to be ready to look hard and be flexible with location options. 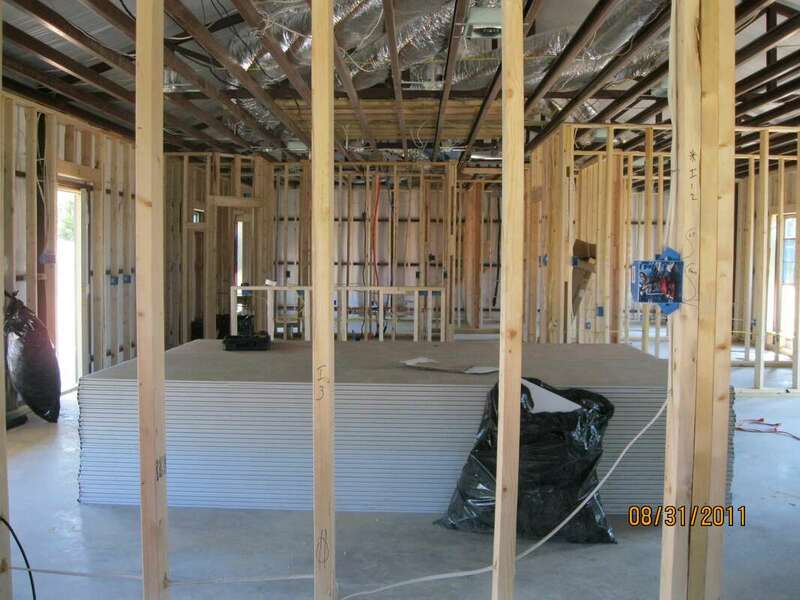 I think the primary reason for lack of wide adoption for barndominium style homes is because most people are unfamiliar with the construction process. Traditional stick and brick home construction has been around a very long time. 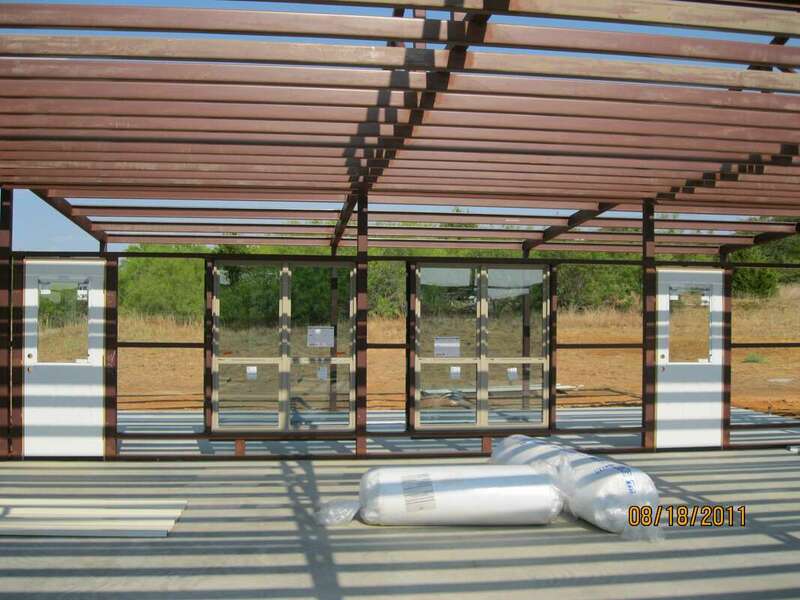 Builders, tradesmen and suppliers are accustom to that process and barndominium construction differs in many ways. 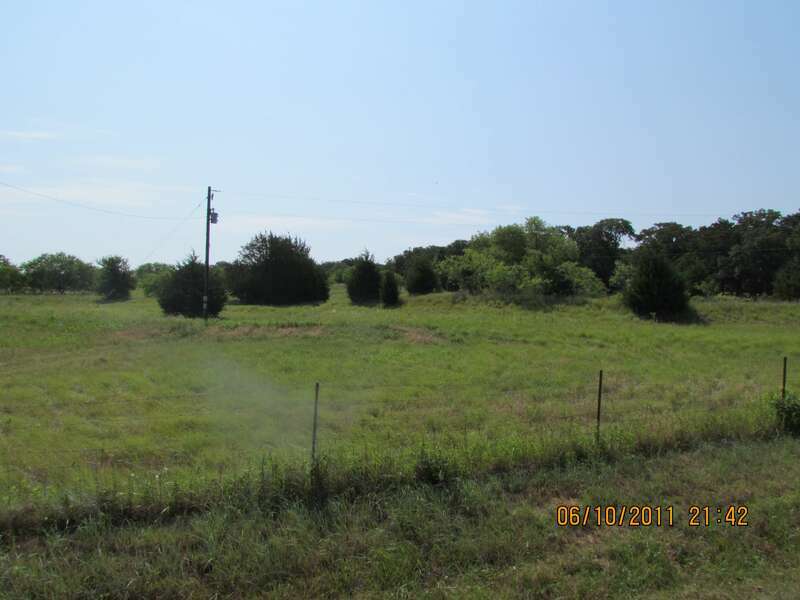 Because you will probably be working with raw land, you will also need to consider the availability of utilities. Electric service will be your primary concern, although it is becoming more reasonable to consider solar and battery technology to eliminate reliance on a power grid. 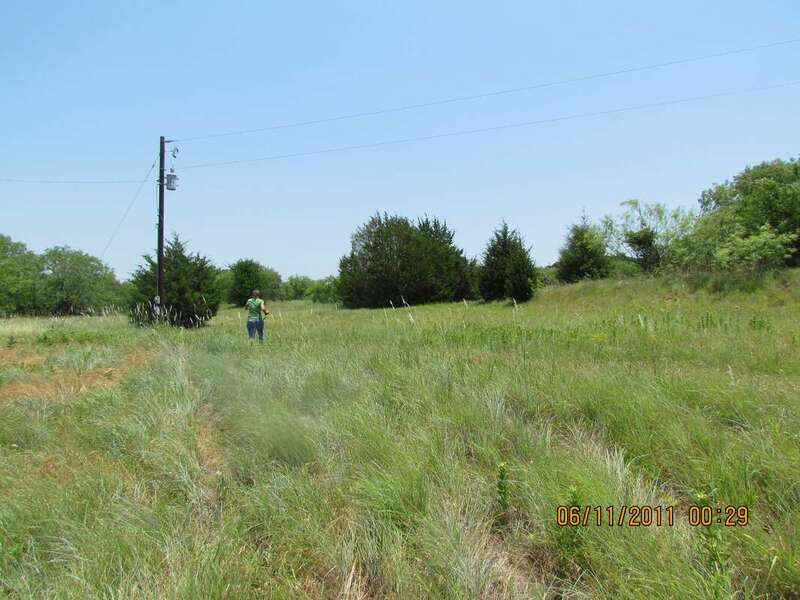 ​We were able to have immediate access to electric and water service on our property we bought to build our Texas Barndominium home. 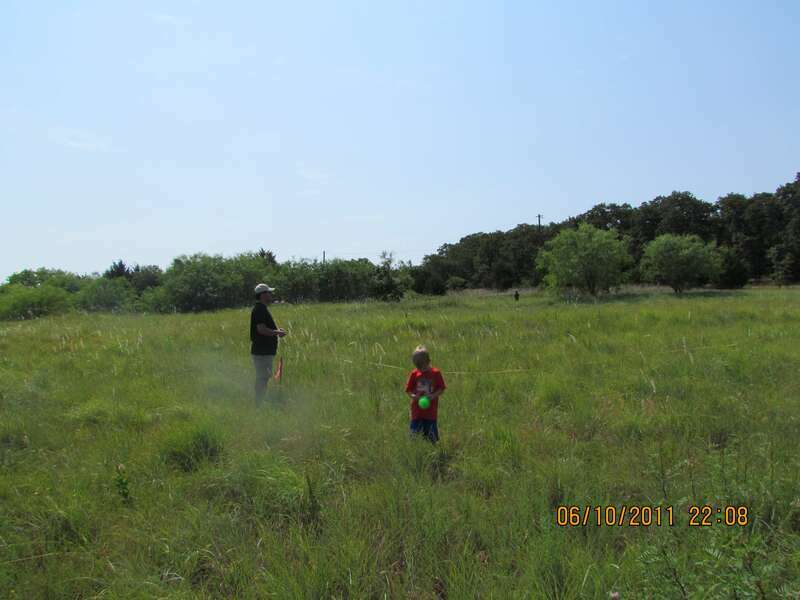 We did have to utilize an on-site septic sewer system. 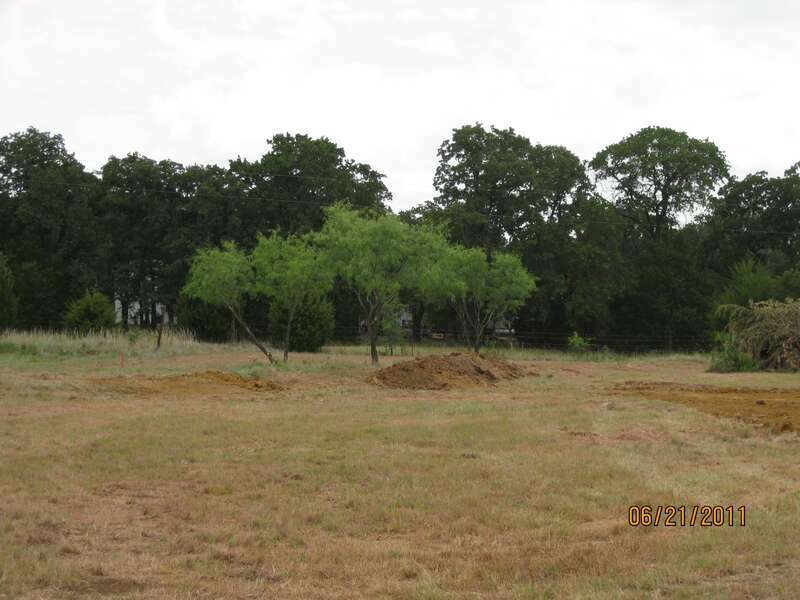 If your prospective property will require septic sewer you definitely want to check the regulations for septic systems in the area. 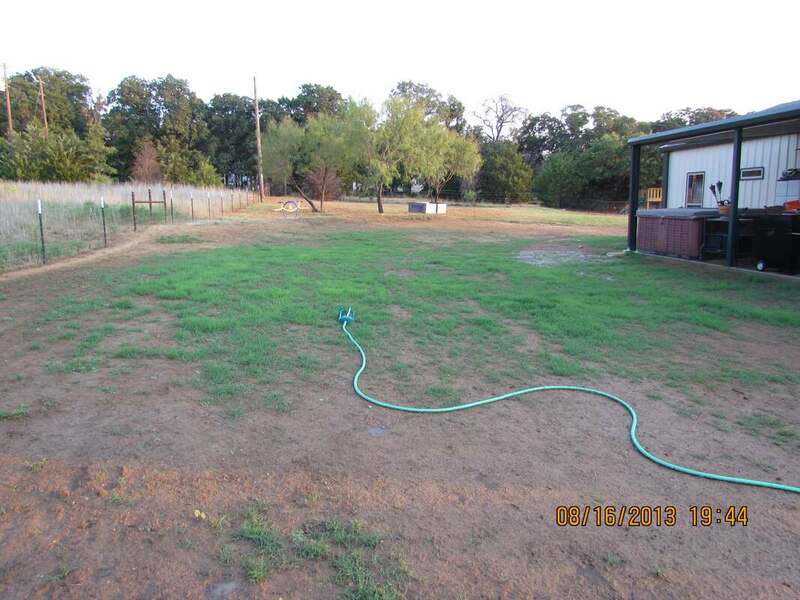 If a water well is your only option, be sure to consult a reputable well installer to explore the ground water availability ahead of time too. 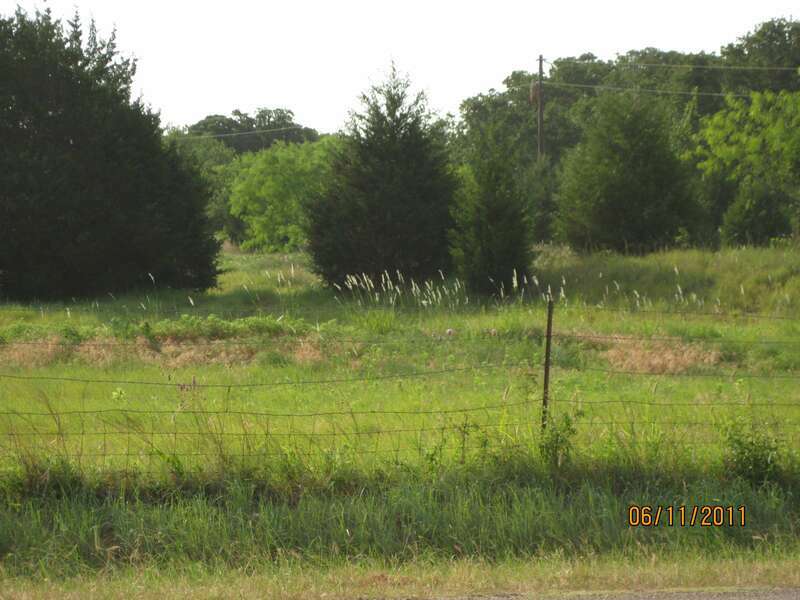 Electric, water and sewer is a primary consideration for any potential piece of property for your barndominium building site. The costs associated with setting up utilities needs to be a part of your initial cost estimating. Property Clearing and Excavation for Bandominium Construction! 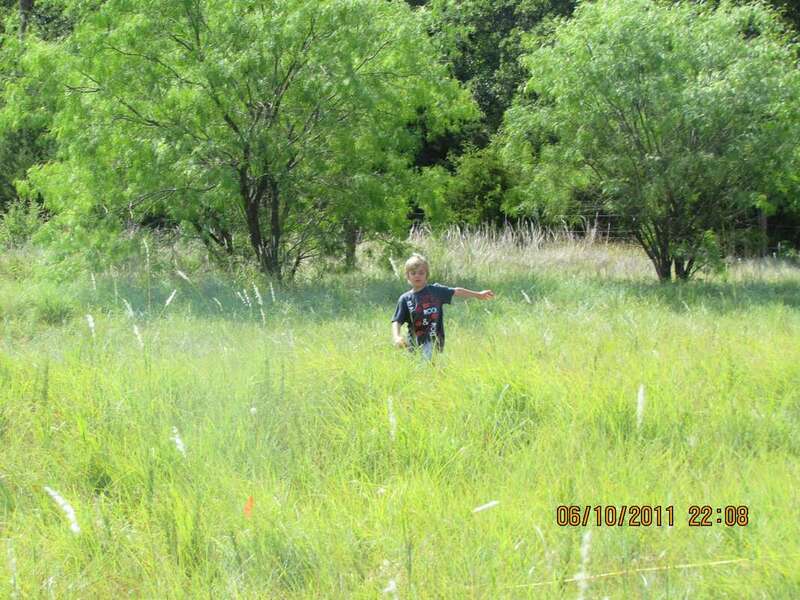 Our land was basically an old pasture. 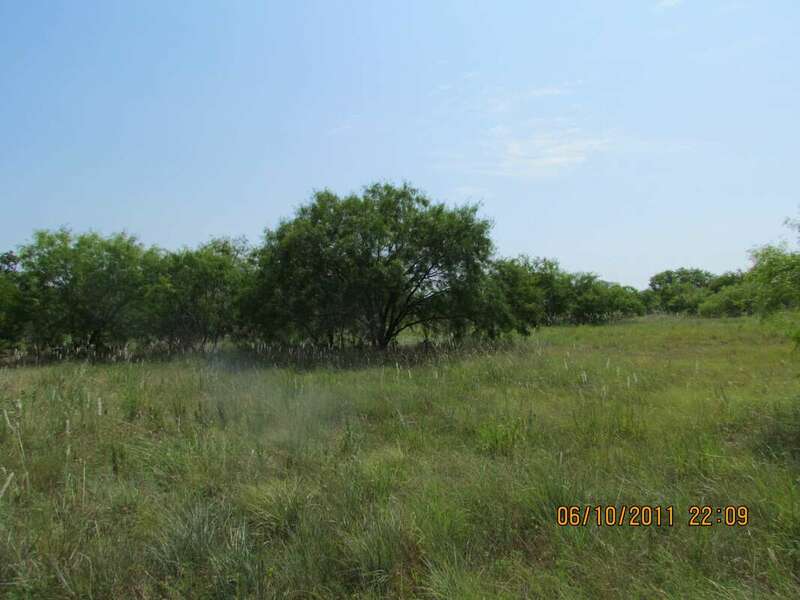 There was tons of brush and small mesquite trees throughout. There was also quite a bit of various trash mixed in from the farming and other activity on the property over the last hundred plus years. 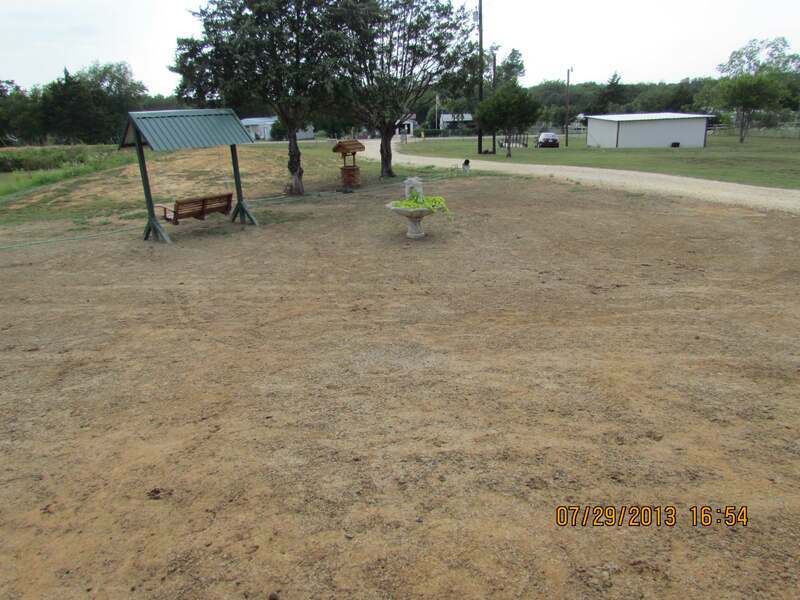 It took several weeks to clean, clear and complete all of the dirt work. 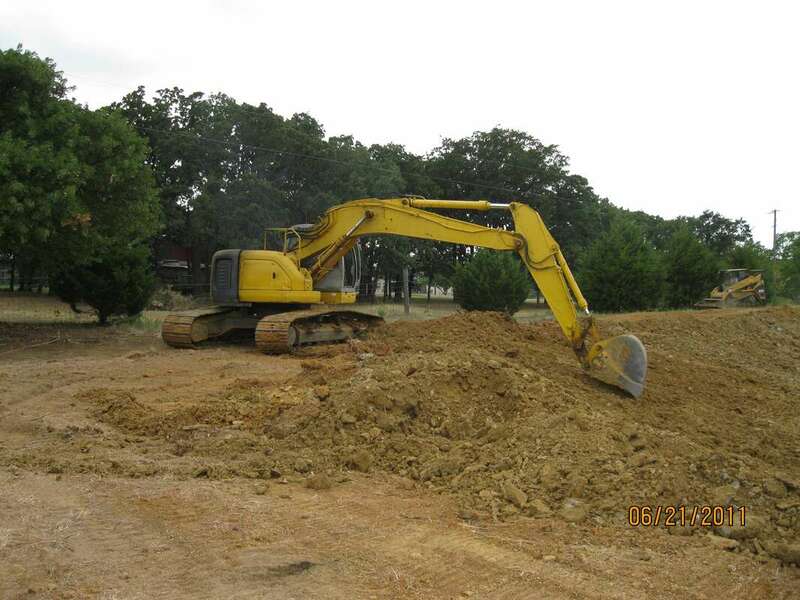 Excavation can be a significant part of your budget. 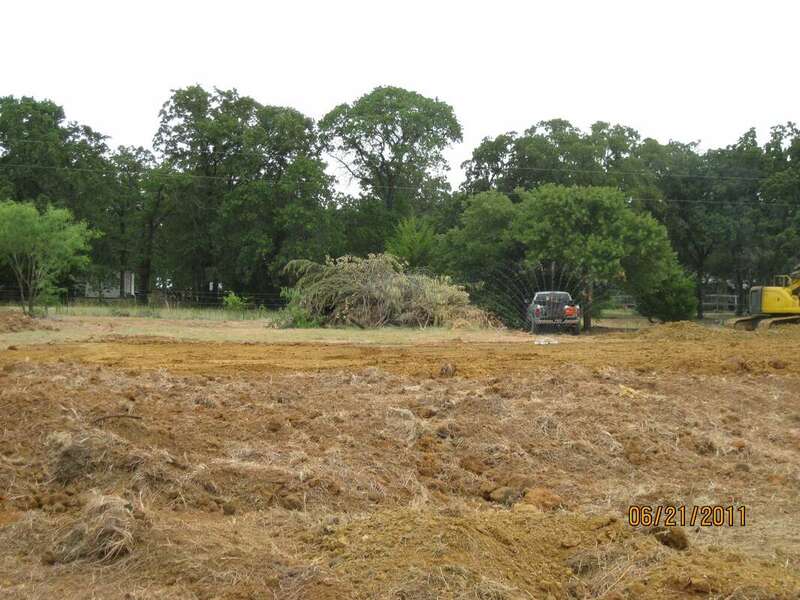 We bought a very sloped piece of property that required extensive planning to create our barndominium build site. 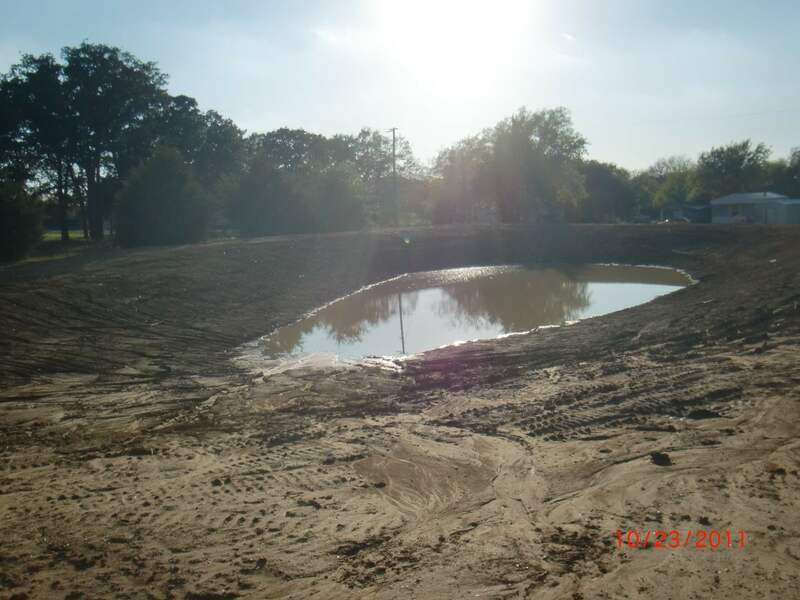 Luckily we were able to include the construction of a pond and utilize the dirt removed everywhere we needed it. 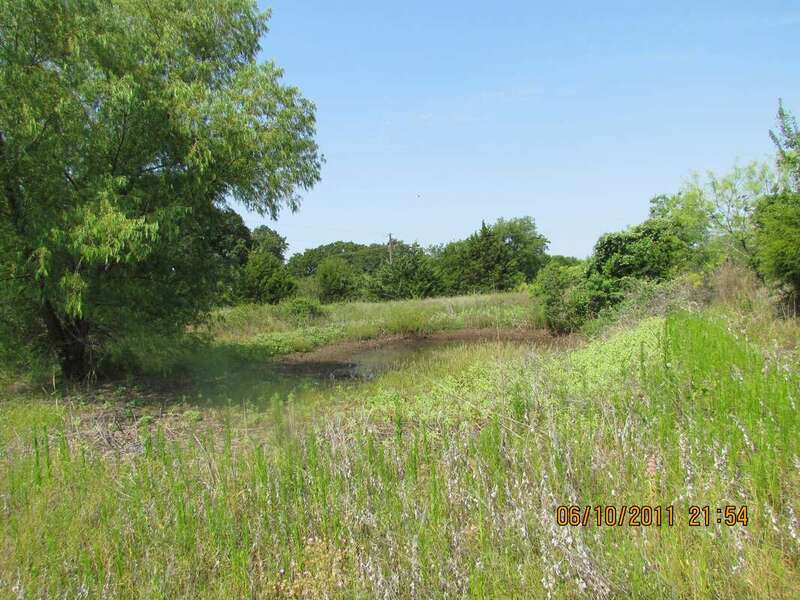 The slope of our property allowed us to have plenty of rain runoff to supply the pond with water. 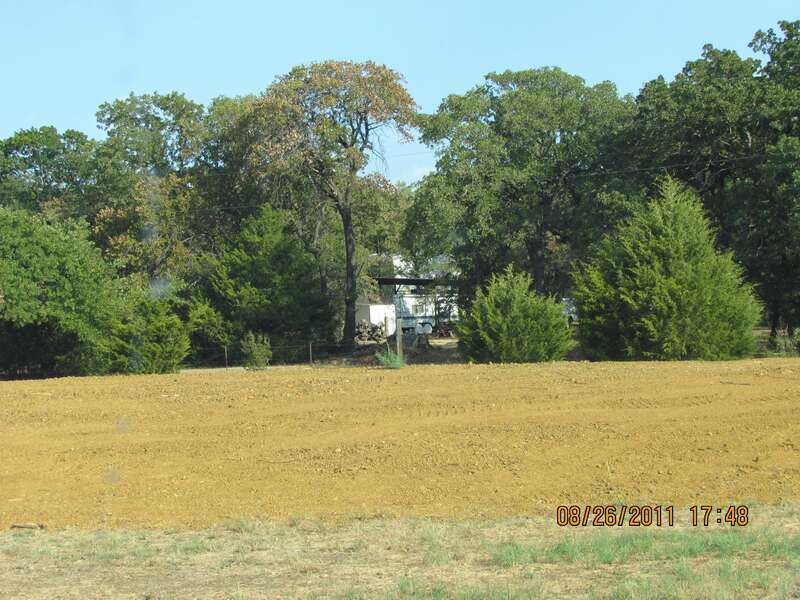 Establishing the prepared dirt pad for building your barndominium home is extremely important. 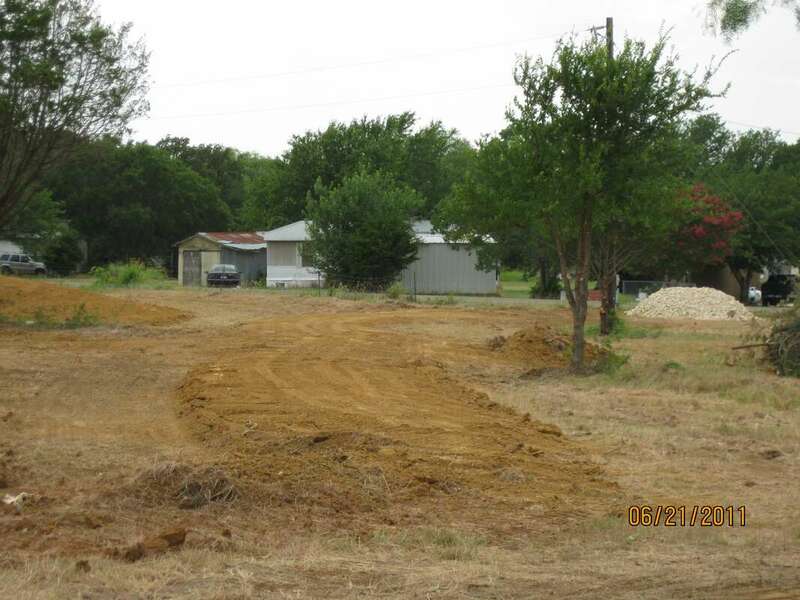 The soil beneath your concrete foundation can wreak havoc in years to come if not properly prepared. 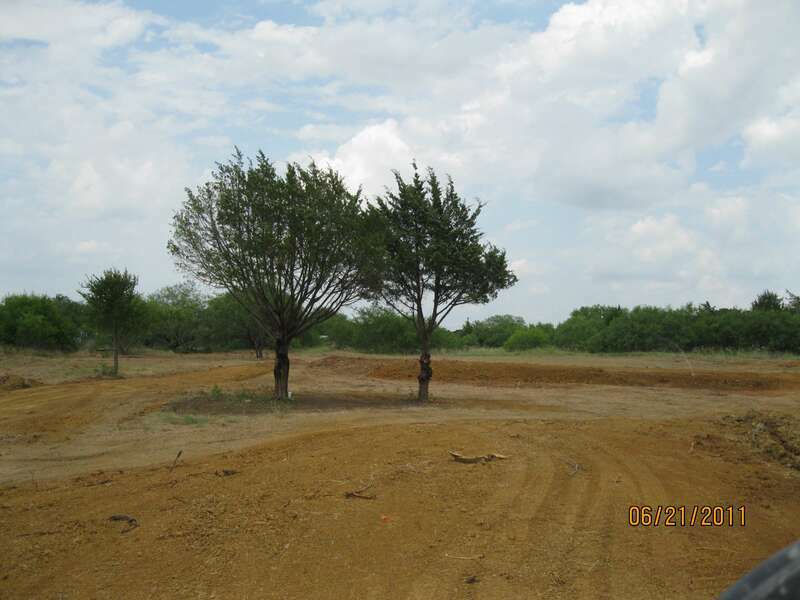 You also want to ensure you don't have expansive clay soils that will swell up if exposed to moisture, or shrink dramatically in drought times. 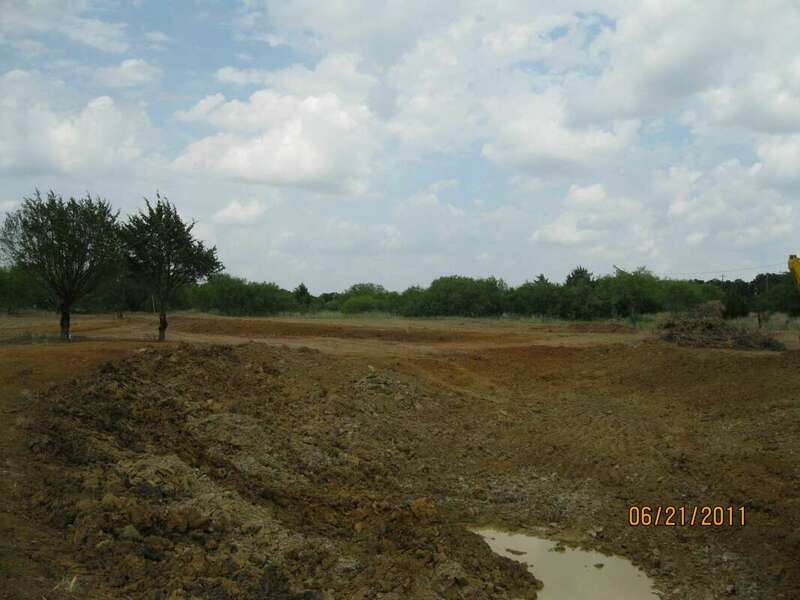 ​It is well worth the expense to have a geotechnical company take soil core samples to analyze and make sure there aren't any surprises hiding below. 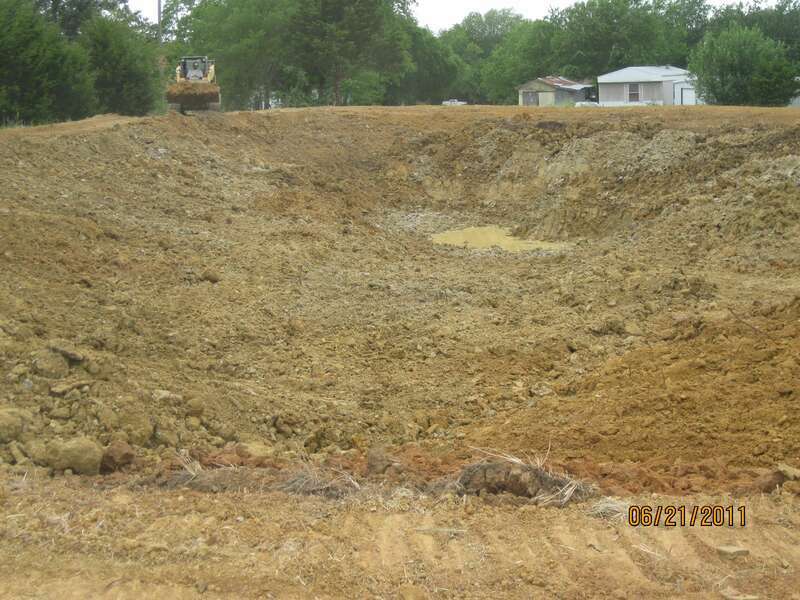 Ground water can sometimes be just a few feet beneath the surface and you also want to be sure you aren't going to build on a giant buried trash pile or something of that nature. 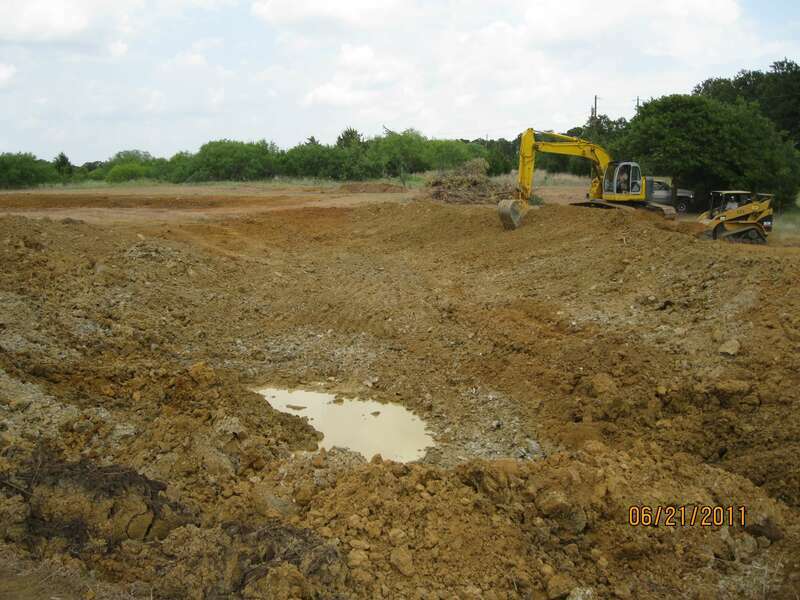 Many structural engineers are not willing to design a foundation plan without a geotechnical report. Ultimately you want to ensure you are building a stable foundation. 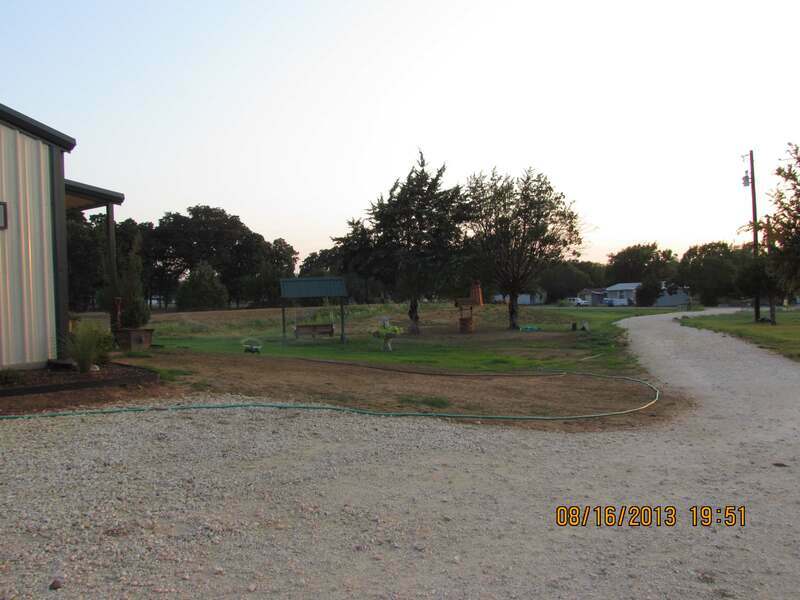 We created a driveway and parking area with road base rock material. 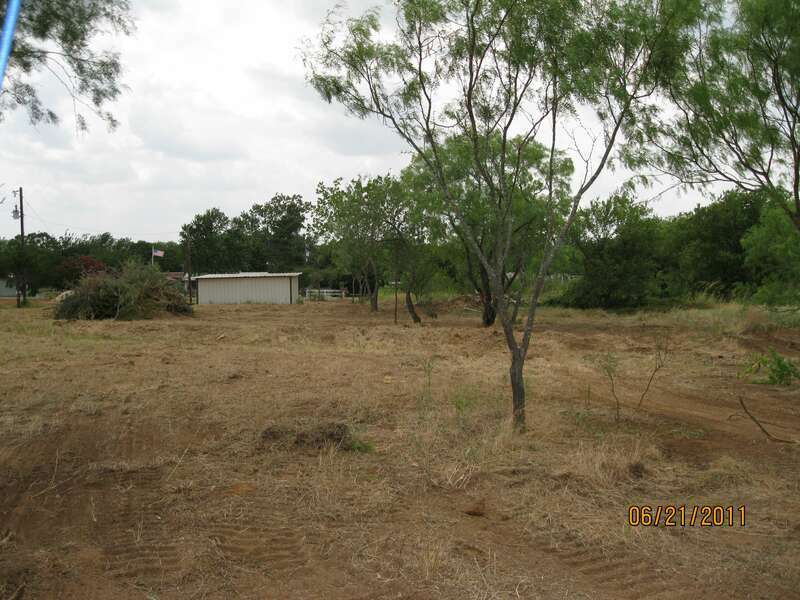 We first used dirt to elevate and compact these areas to create a solid base. That way the road base (or gravel) is above grade and will drain off water when it rains. 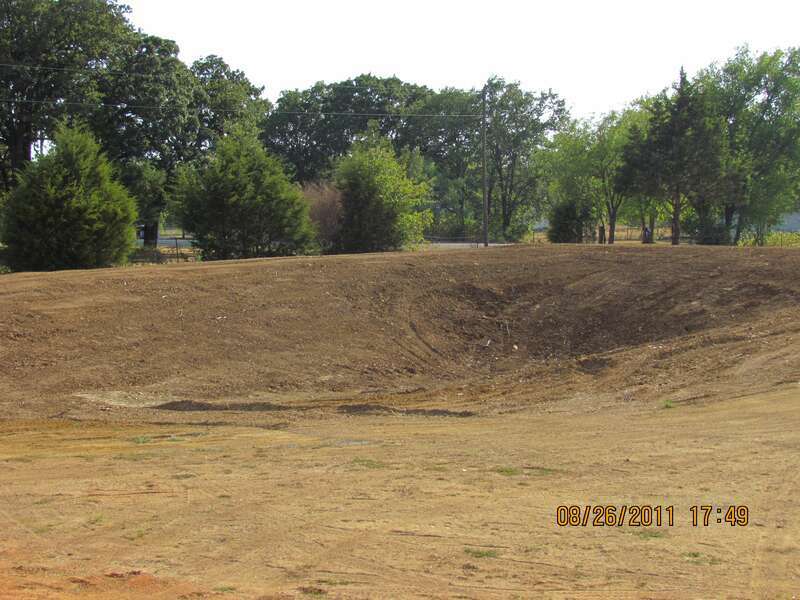 We had plenty of dirt from digging the pond to use for that. 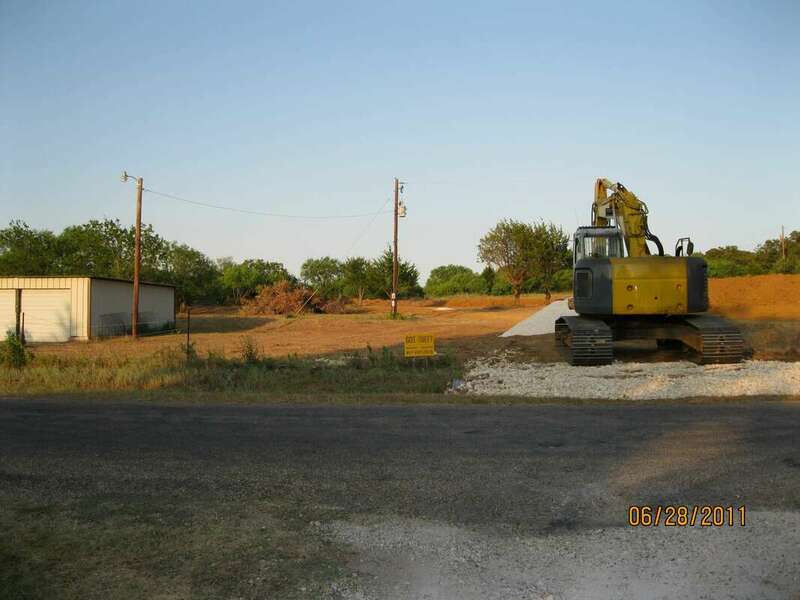 However you go about your excavation needs to prepare for construction, I definitely recommend finding some reason to rent a skid steer loader to operate yourself. It's quite fun learning to operate one! While we were still searching for a piece of property I had been working on scaled sketches for the floor plan and overall barndominium design. 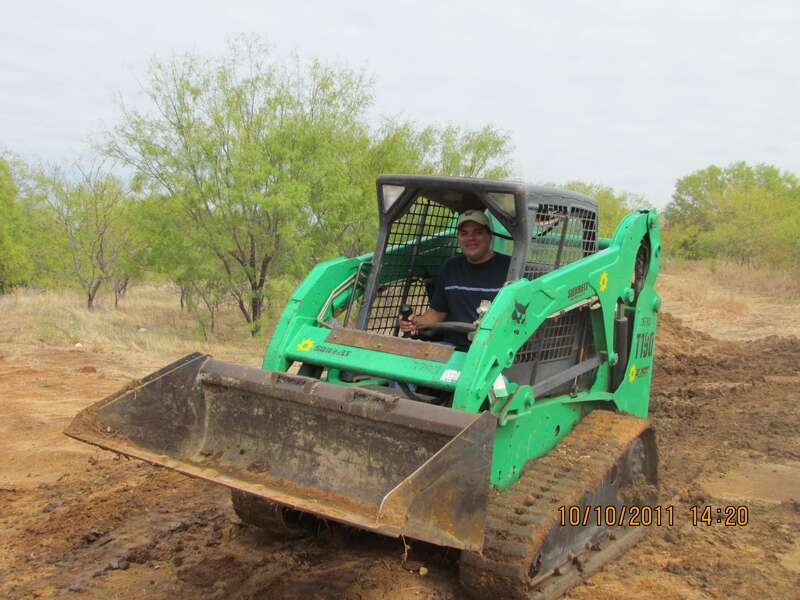 I finished the rough draft during the excavation period. 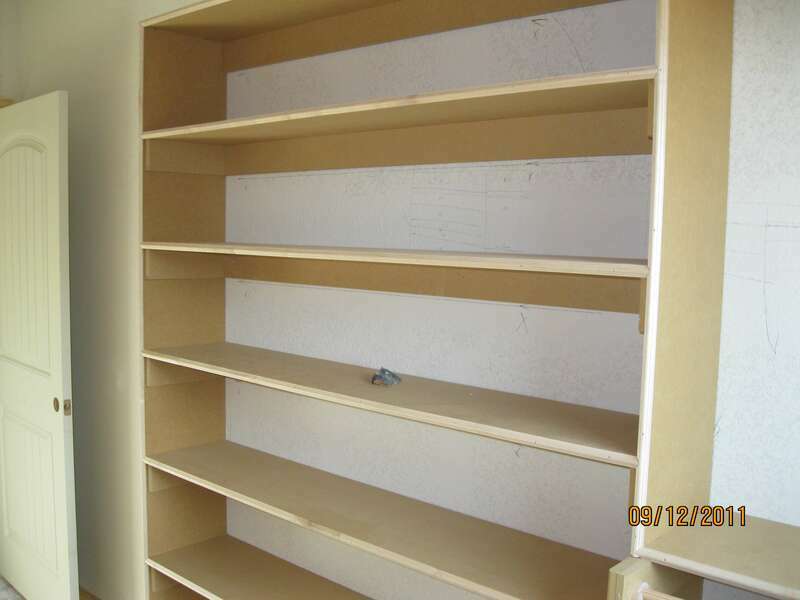 I found a local plan design shop to complete the finalized set of floor plans for the barndominium construction. I only needed basic electrical detailed in my plans. I was also was able to rely on the designer for ensuring I had properly sized various areas and rooms throughout the house. Keep in mind that my build site had no municipal inspections, so my plans were only for my needs and didn't have to be submitted to anyone for review or approval. The overall cost of a barndominium home can vary greatly based on what percentage of your metal building is going to be finished out for interior living space. The larger the metal building is, the more square footage you have at the base cost of building. If you are going to have a large garage or shop integrated, then that area will only consider the per square foot cost of the metal building itself. ​The cost for interior finish out of a barndominium home can swing the budget dramatically. We ultimately designed an open floor plan that met our needs and we finished out the entire interior of our metal building. 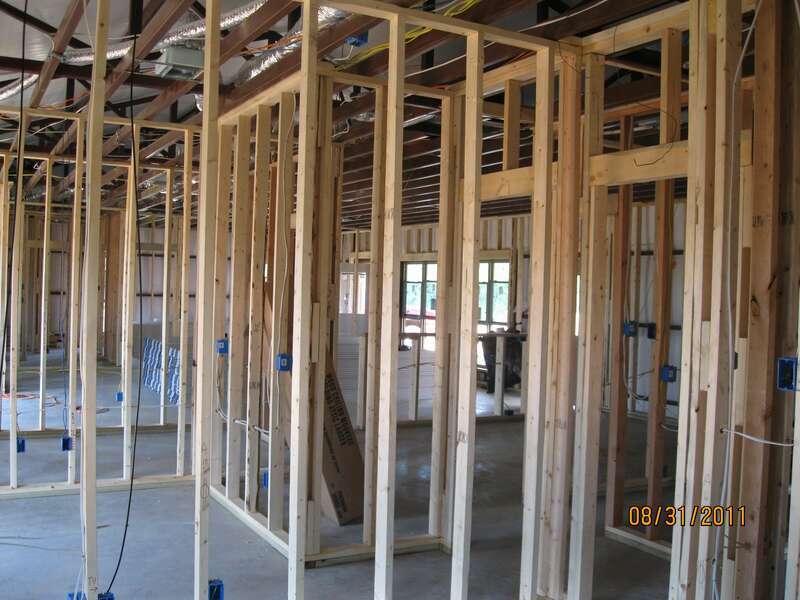 The more open the floor plan, with less interior walls to construct, the lower the overall cost per square foot will be. A nice consideration of building this way is that none of the interior walls are load bearing (carry any weight), so you can have large open interior areas with little consideration of how far the ceiling spans are. 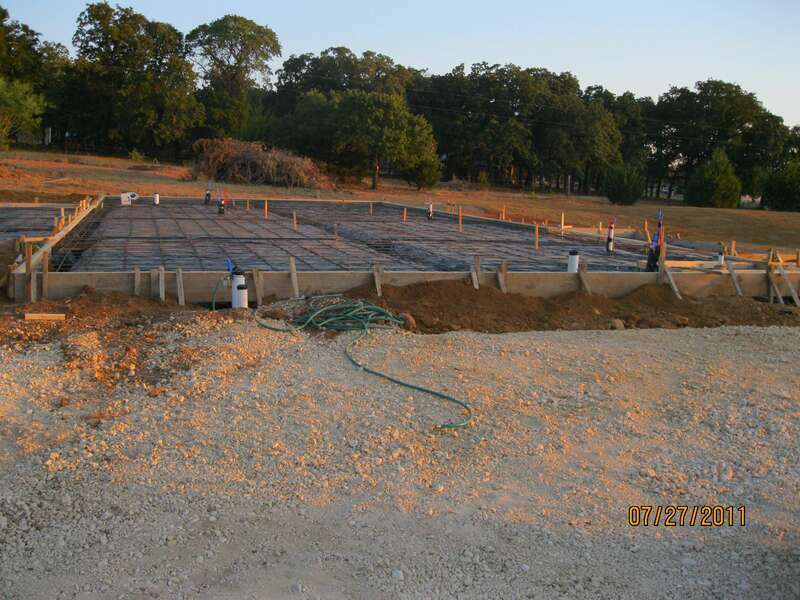 Rough-in plumbing and slab on grade concrete foundation for our Barndominium Construction! 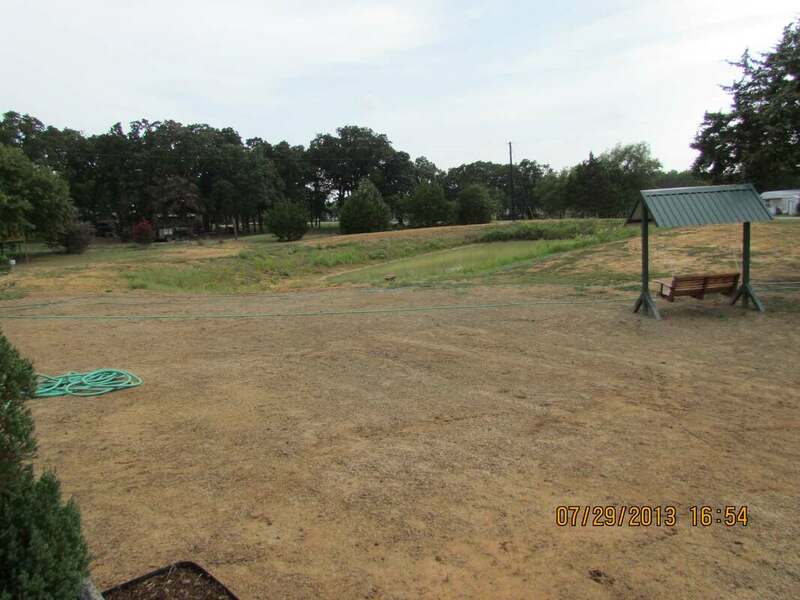 Our barndominium homes living space is approximately 2,000 sq ft. Then you have the large covered back patio and covered front porch. 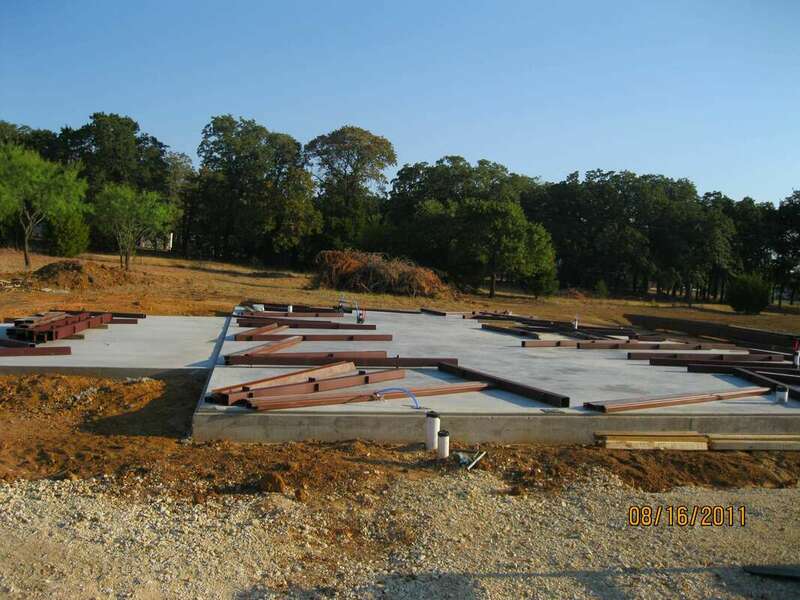 The total area under roof, or concrete slab total, is 2,682 sq ft.
​I elected to go with a rebar steel reinforced concrete foundation design. We didn't have any special particulars related to ground conditions, so the slab on grade concrete foundation is pretty straight forward. 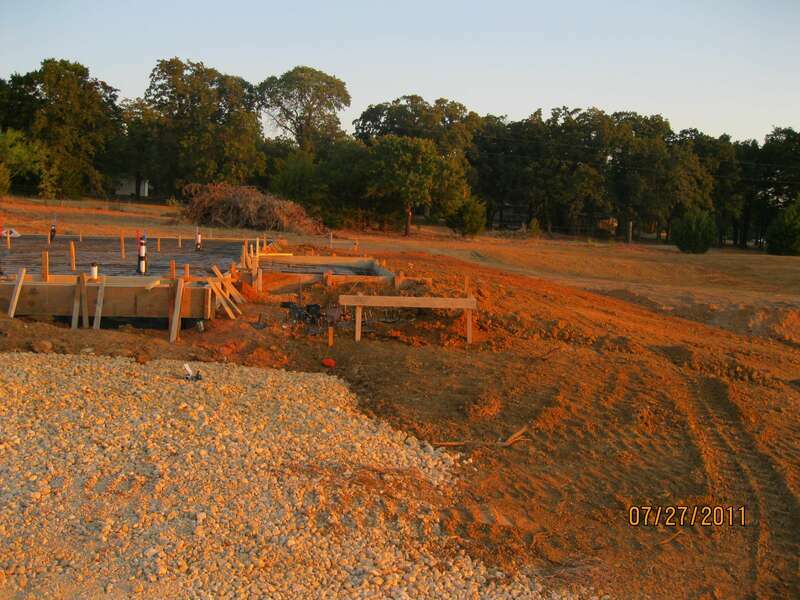 The concrete guy got his trenches dug, forms set and the rebar steel all tied in. Plumbing was roughed-in and we were ready to pour concrete. We were in the middle of a extremely hot drought period, so they started pouring concrete at 6:00 am to beat the heat. 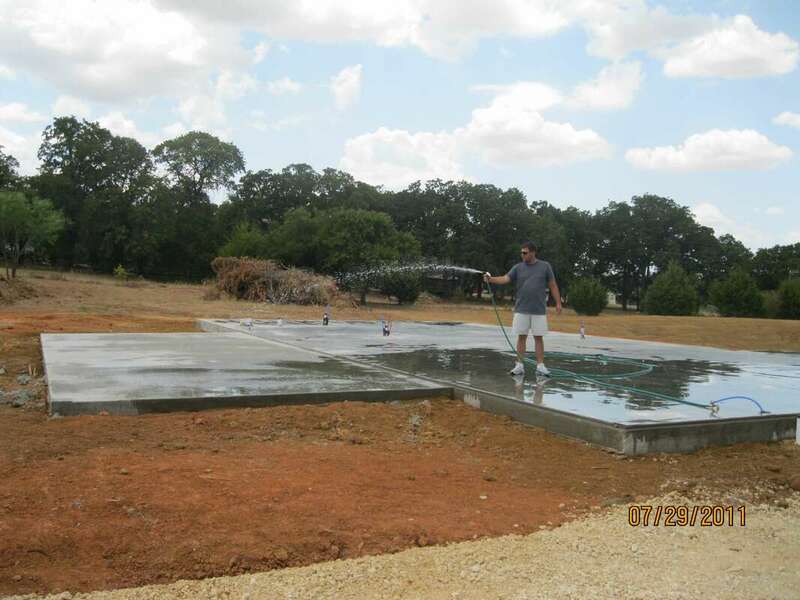 To tell you how hot is was (Texas HOT), the day before pouring concrete I was walking across the black plastic checking some final measurements. It was in the peak heat of the day and the soles on my running shoes melted right off! 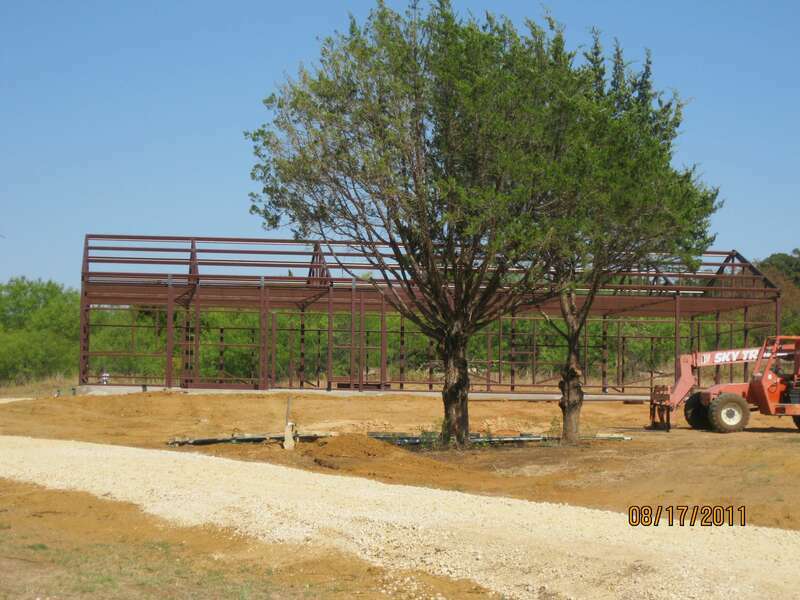 Metal Building shell for Our Texas Barndominium is going up up up! 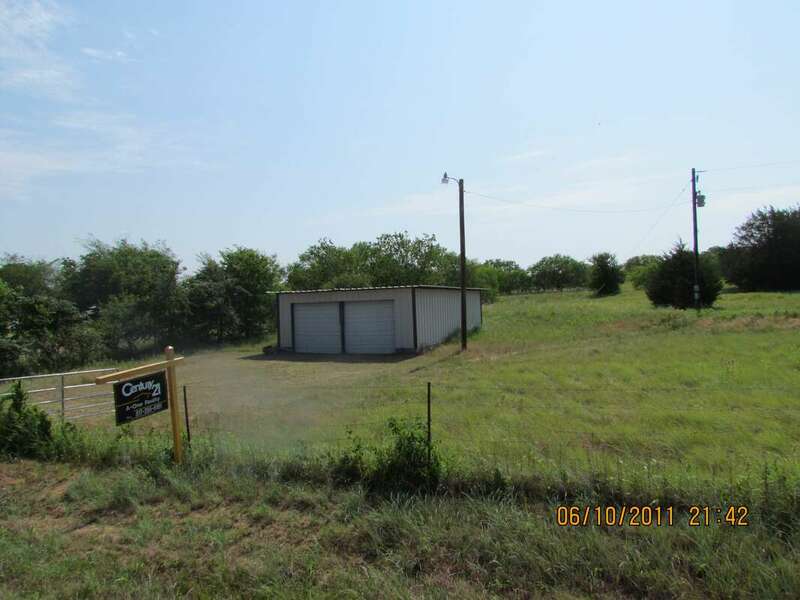 I had a difficult time identifying a contractor to erect the metal building. 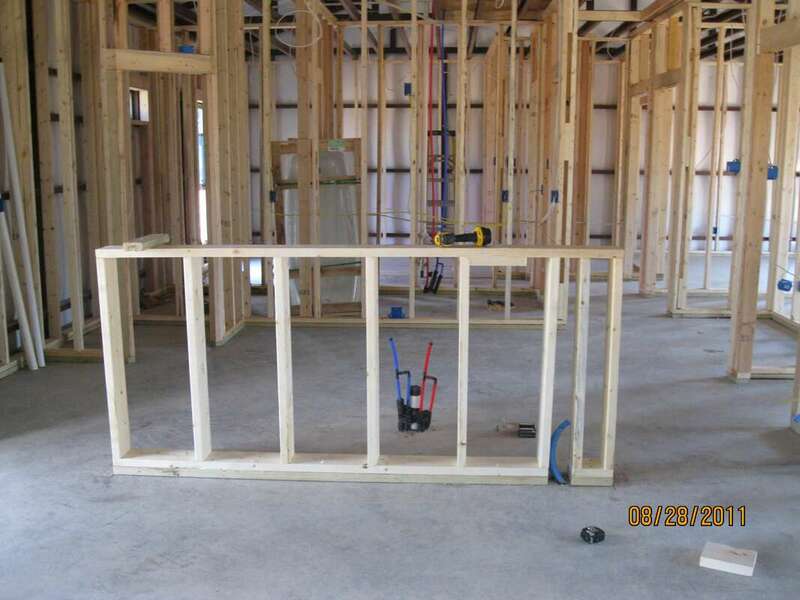 When you are building a home this way there are many details to the steel framing that have to be thought through. 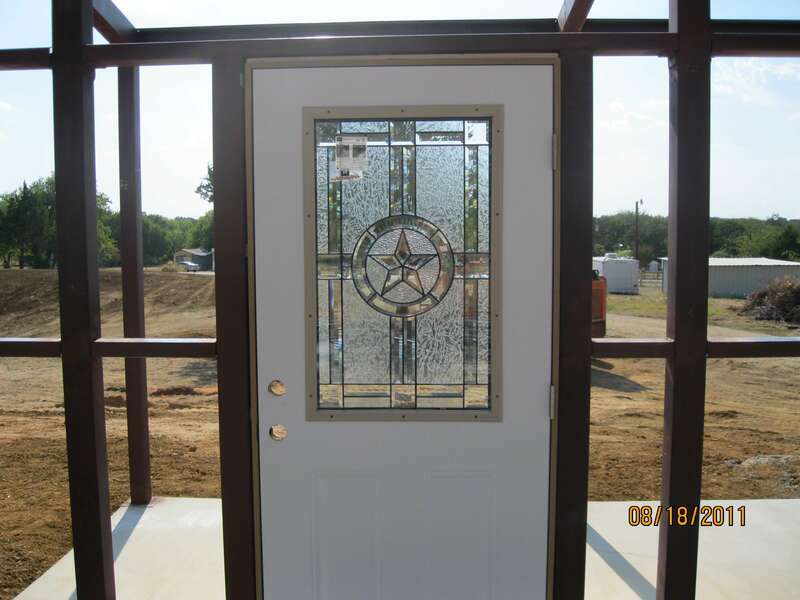 If you erect a standard steel building kit it can be difficult to place windows and doors exactly where you want them. 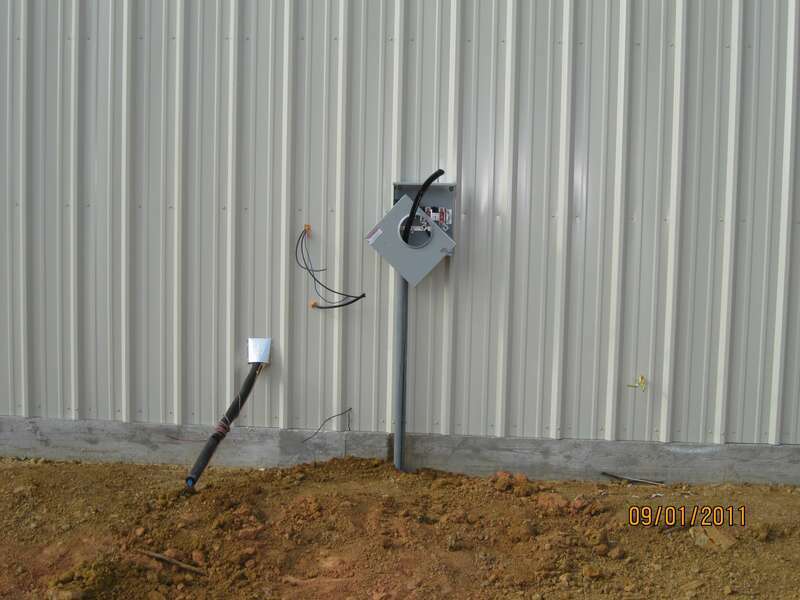 If a steel support pole or beam is in the way you are just out of luck. ​I'm sure there are some pre-fab metal building kit manufactures that can get into extensive design details, but I wanted a true custom fabrication for our barndominium house. 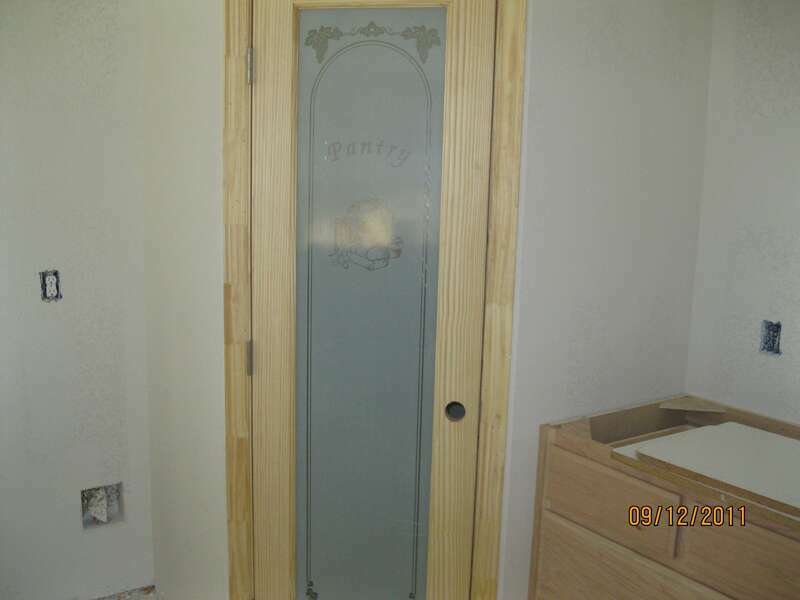 There were some details only a true custom fabrication could accomplish. 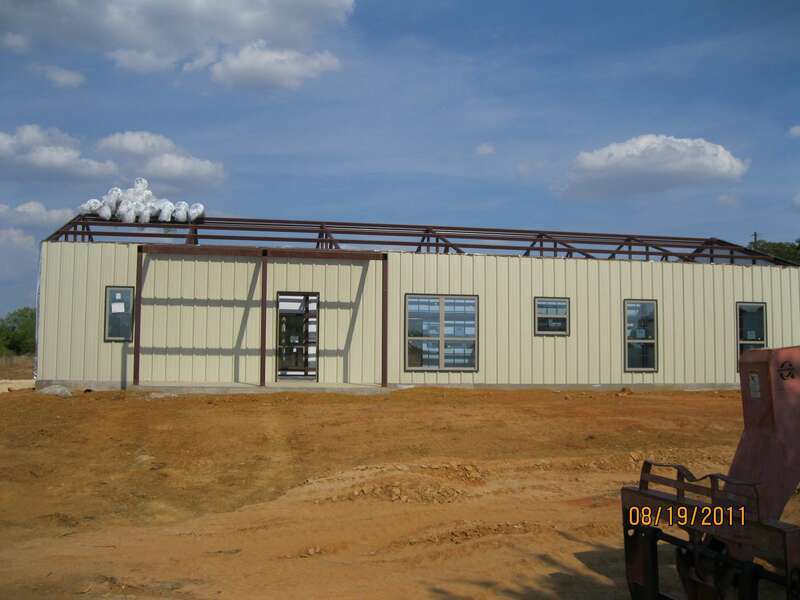 From the pre-fab metal building research I did, it seemed the pricing for the kits was more of a retail cost and there is also shipping cost involved. 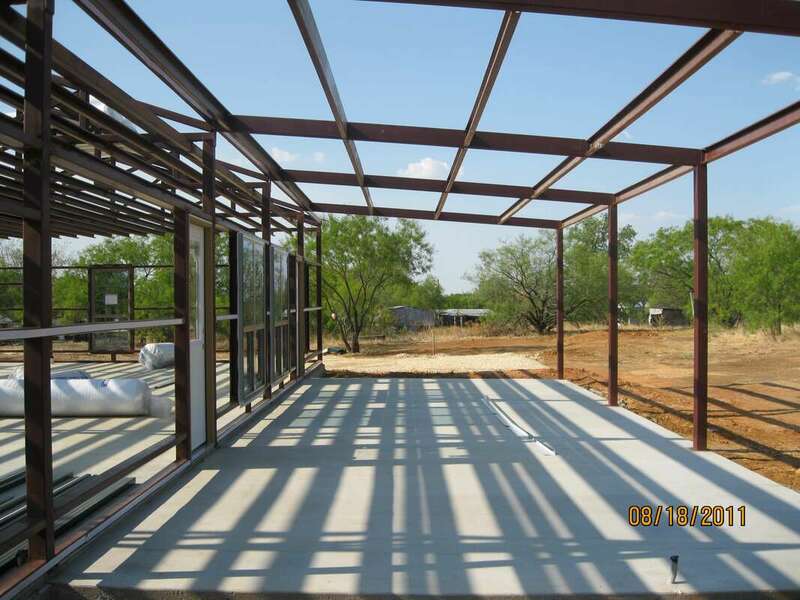 I ultimately felt better about a fully welded steel structure vs bolt up steel framing of any kind. 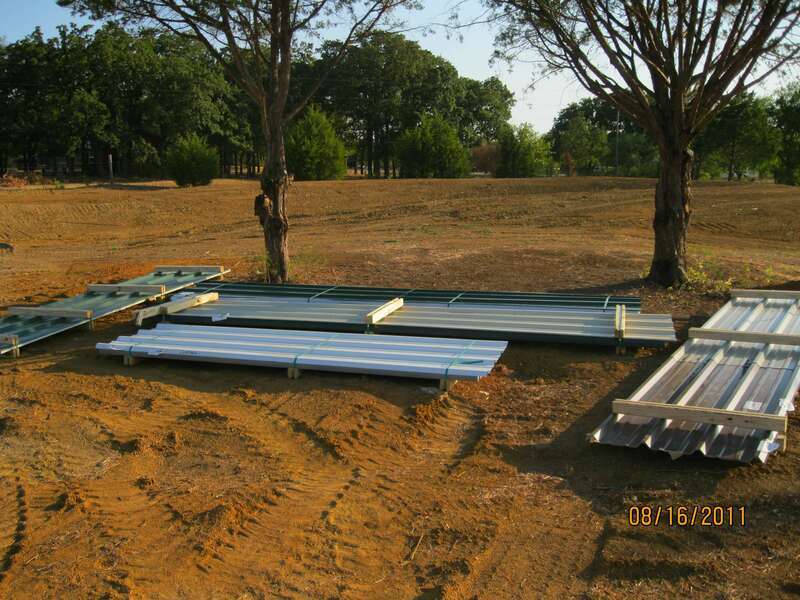 I had a metal building contractor lined up, but still didn't feel 100% confident with them. Luckily at the last minute I came across an alternative that I hadn't spoke to previously. After one conversation with the new metal building erection contractor I knew I had the right one. My custom steel building fabricator brought up some great additional considerations. 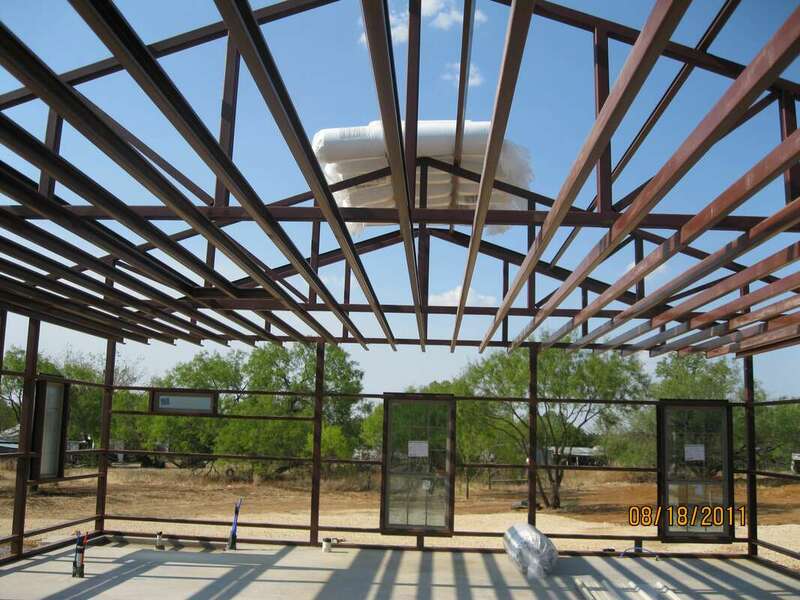 They modified the building design so that the steel framing would include the structure for our finished ceiling througout the house. 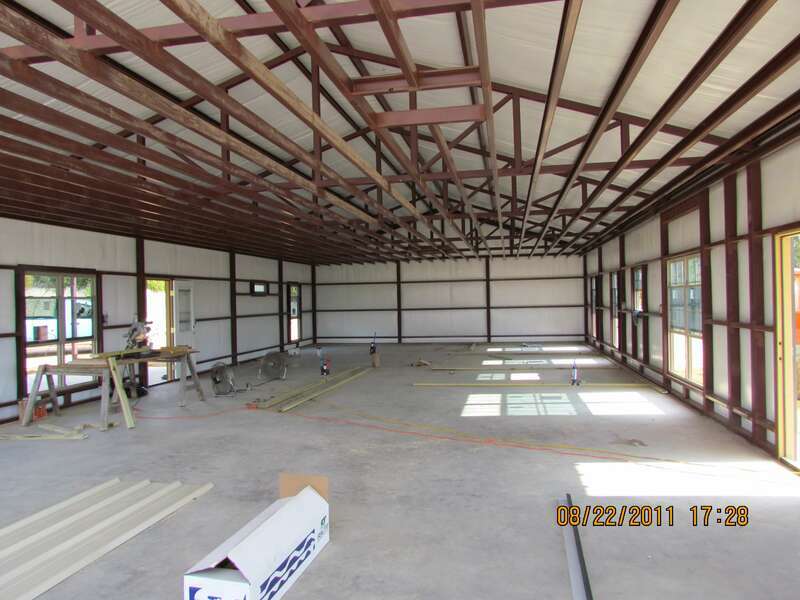 The steel C perlings were ran across the entire ceiling of the barndominium steel framing. 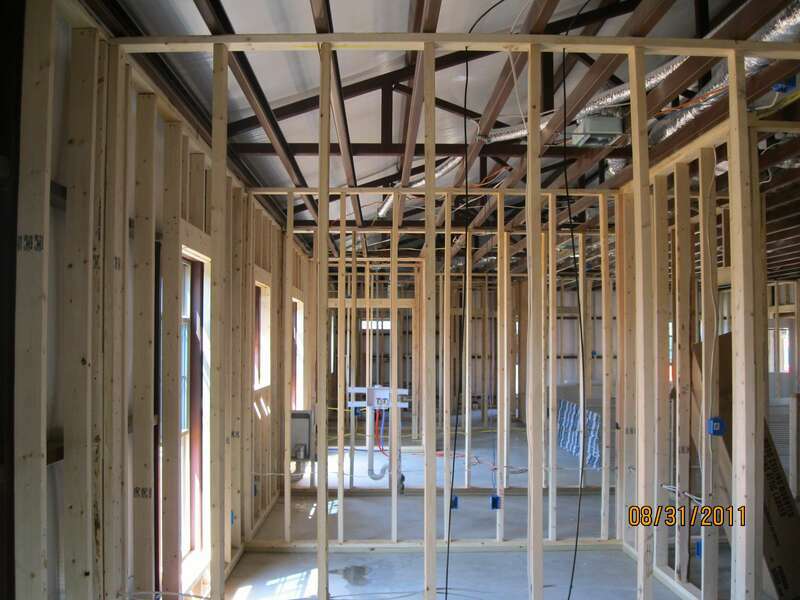 The ceiling height allowed me to buy lumber for the interior walls that required no cutting, they could be stood right up and fastened directly to the C perlins. Prior to that I planned to frame the interior ceiling with rafters of some sort. I think the overall cost was about a wash, but it saved a lot of time and added to the structural integrity of the steel building frame. 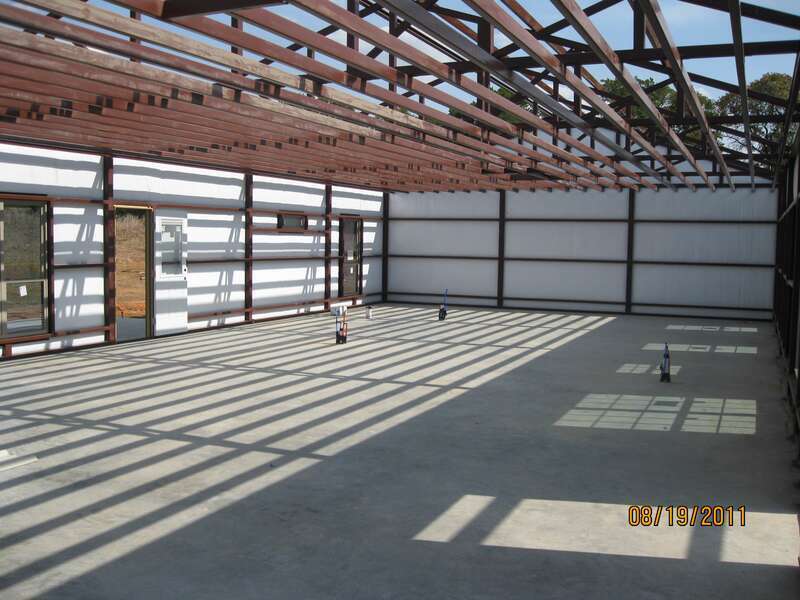 The construction of our steel building utilized R-13 batt insulation with a reinforced polypropylene vapor barrier backing behind all of the sheet metal including the roof. Ensuring you protect against moisture vapor is extremely important. Steel will form condensation with any significant temperature change. You must ensure that your vapor barrier is near perfect to eliminate the potential problem of moisture accumulation within your barndominium. 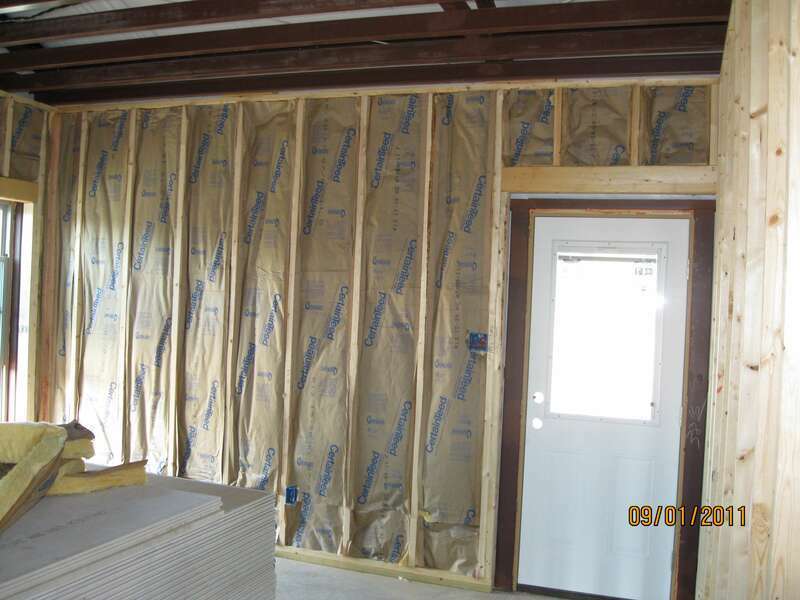 ​I also fully insulated the interior wood framed walls with traditional R-13 faced batt insulation and blow in R-40 insulation in the attic. 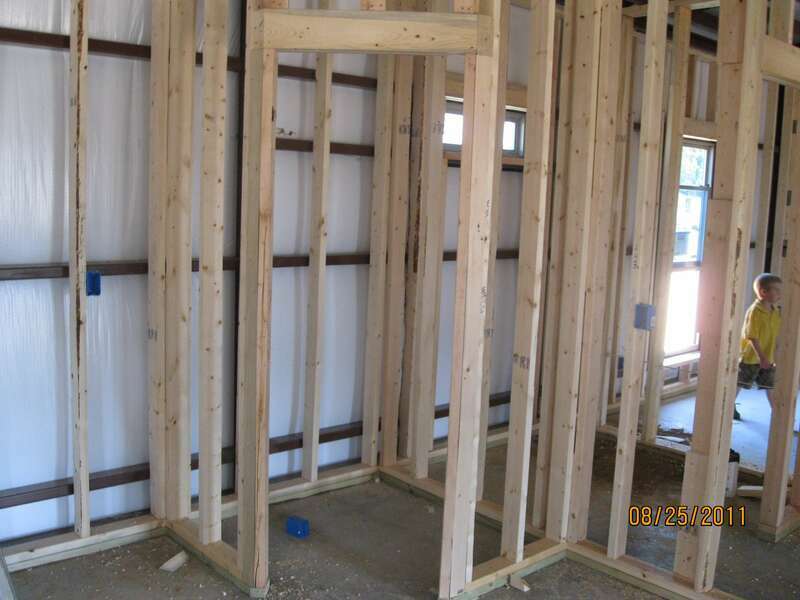 There's an air gap in the exterior walls between the exterior and interior insulation. Air voids are an excellent insulator in itself and the space for air flow is a good extra protection for any moisture potential. 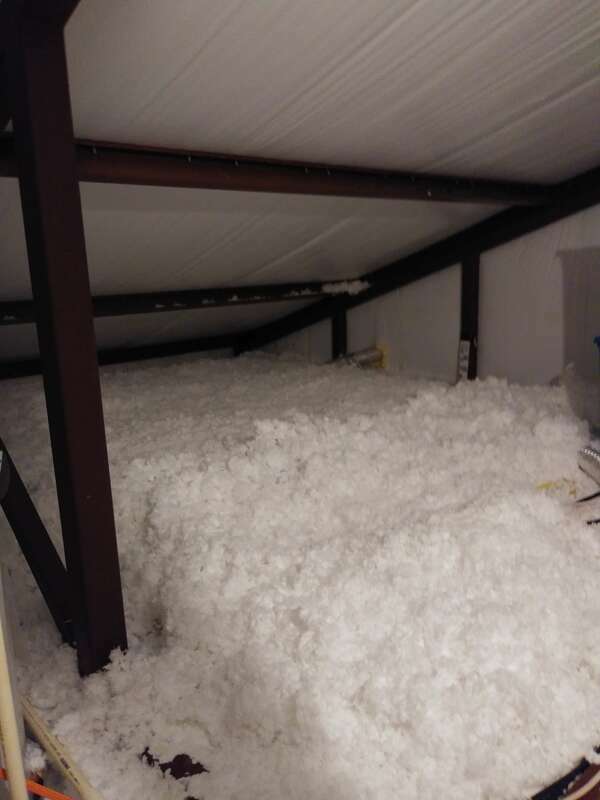 I considered spray foam insulation for the inside of the metal building, but I couldn't justify the additional cost at the time. 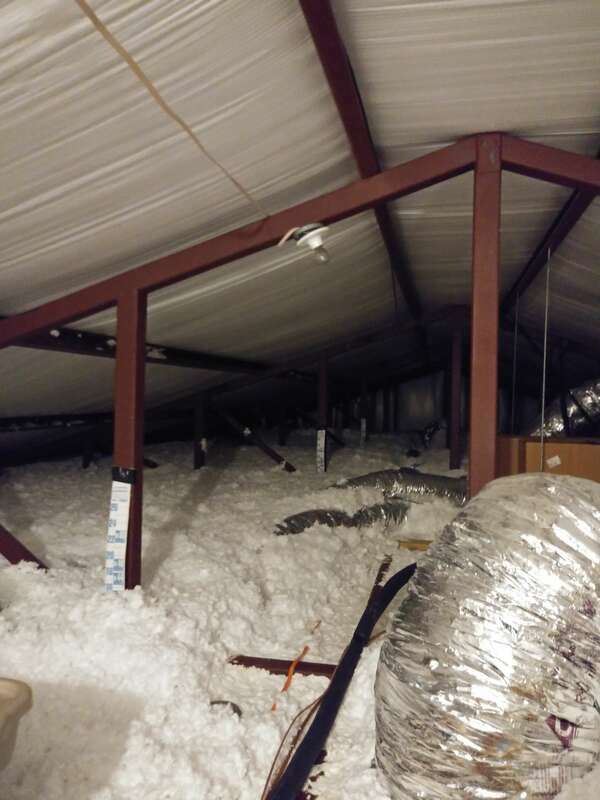 The batts against the steel sheeting inevitably allow the building to breath just a little, compared to spray foam sealing everything completely. 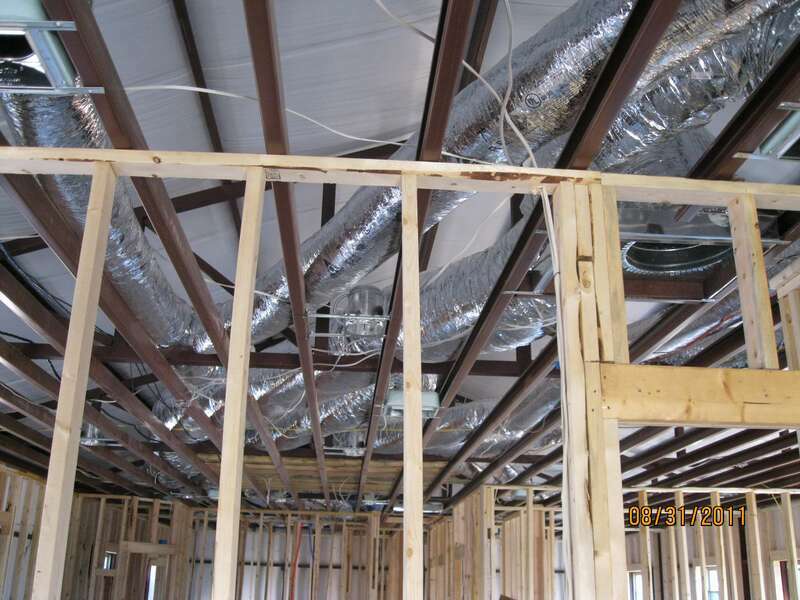 Having a 100% sealed building envelope presents the need to address indoor air quality. You deal with that by incorporating a separate mechanical fresh air system or using your HVAC to introduce fresh air from outside. 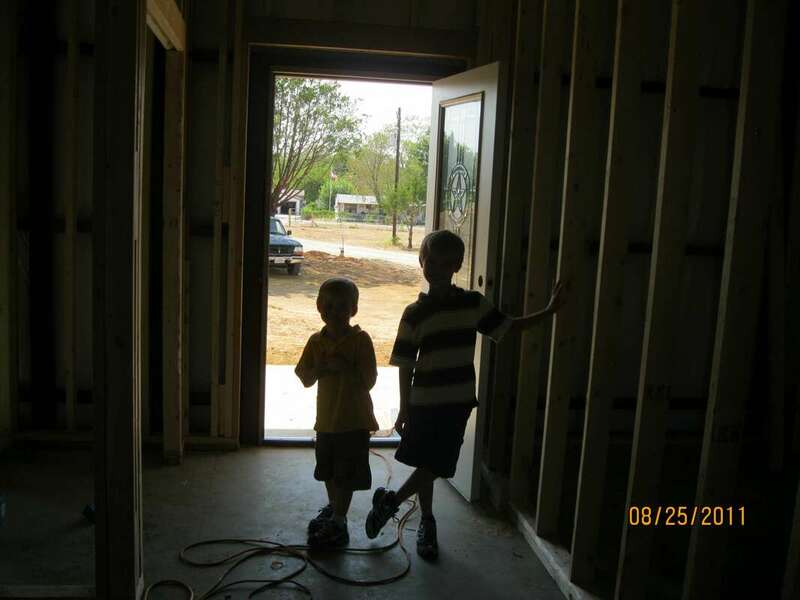 There was additional cost involved with the fresh air component, so that was another reason I opted away from spray foam insulation at the time. 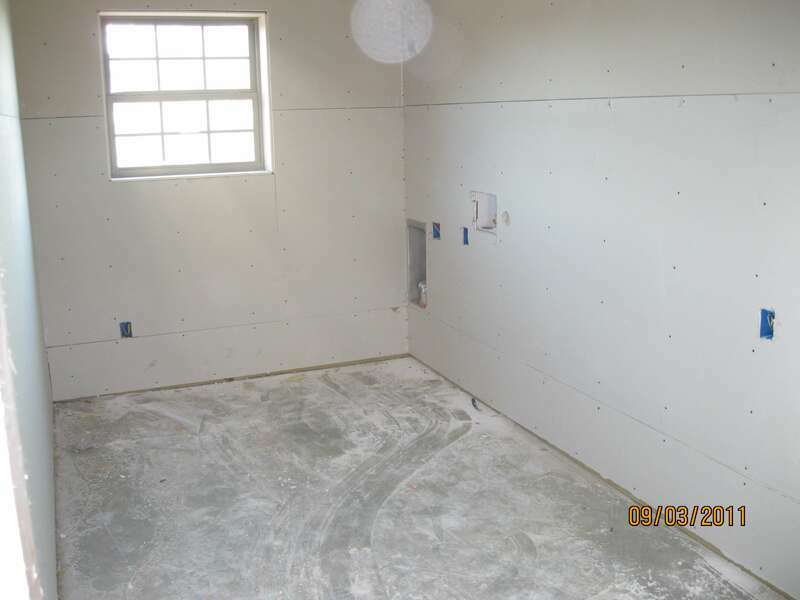 The cost of closed cell spray foam has come down quite a bit over the years since we built our barndominium. I also think the foam products used and the talent of your average applicator have gotten better. 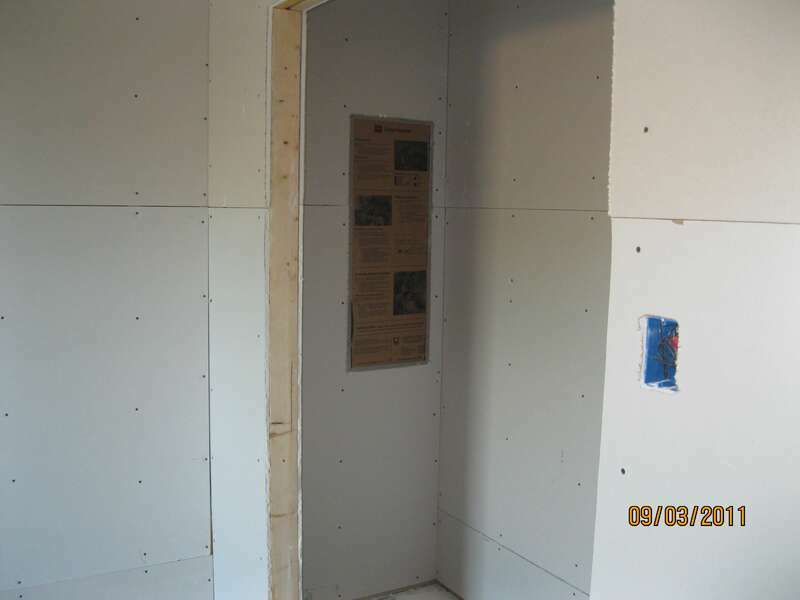 If I built again today I would certainly use closed cell spray foam on the entire interior of the metal building. 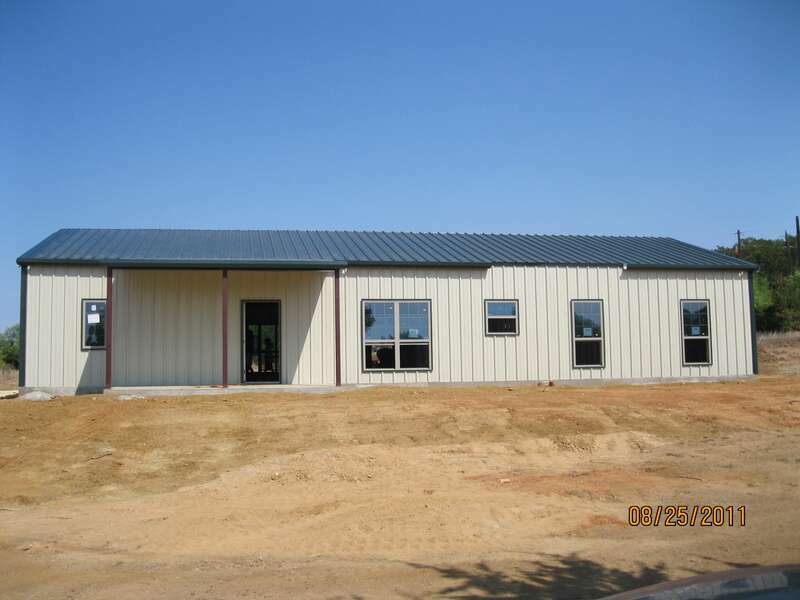 The metal building came together wonderfully and the contractor did excellent work with all of the windows, doors, flashing and trim. 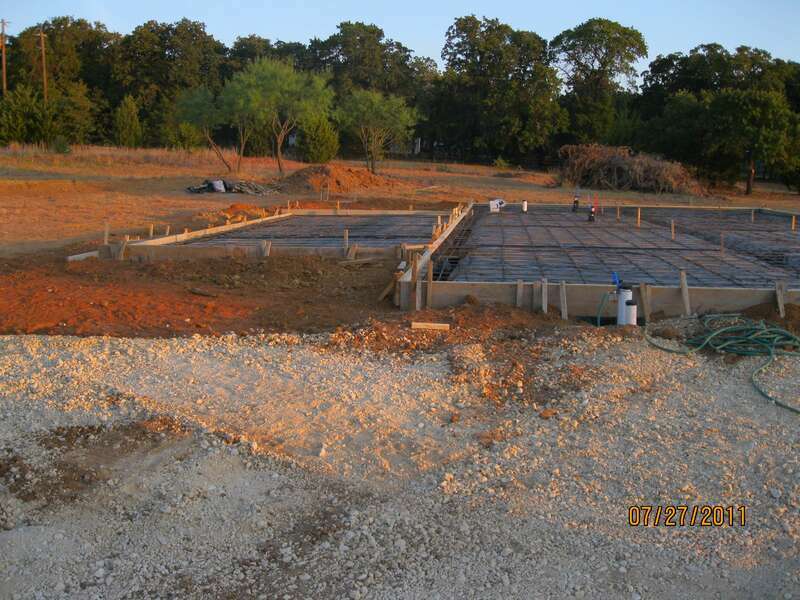 Our Texas Barndominium home was taking shape! 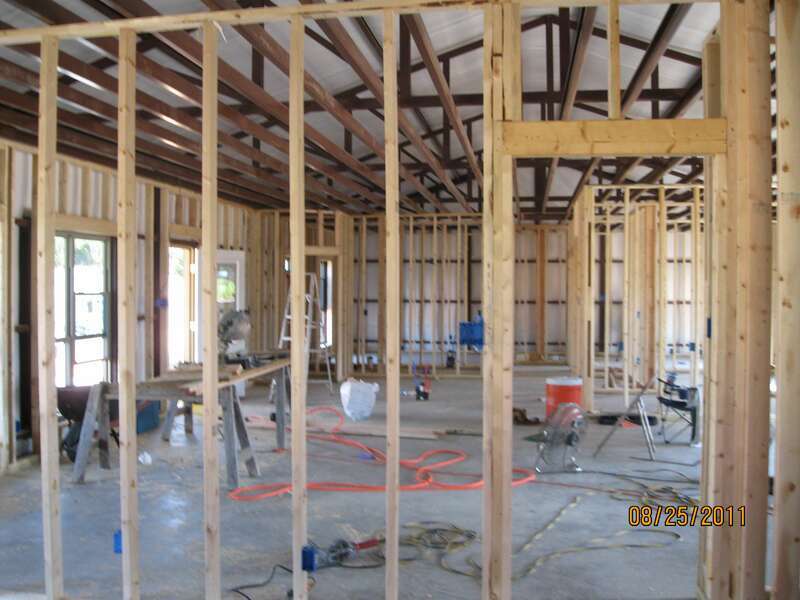 Time to frame up the interior walls and start electrical and plumbing top-outs on Our Texas Barndominium! 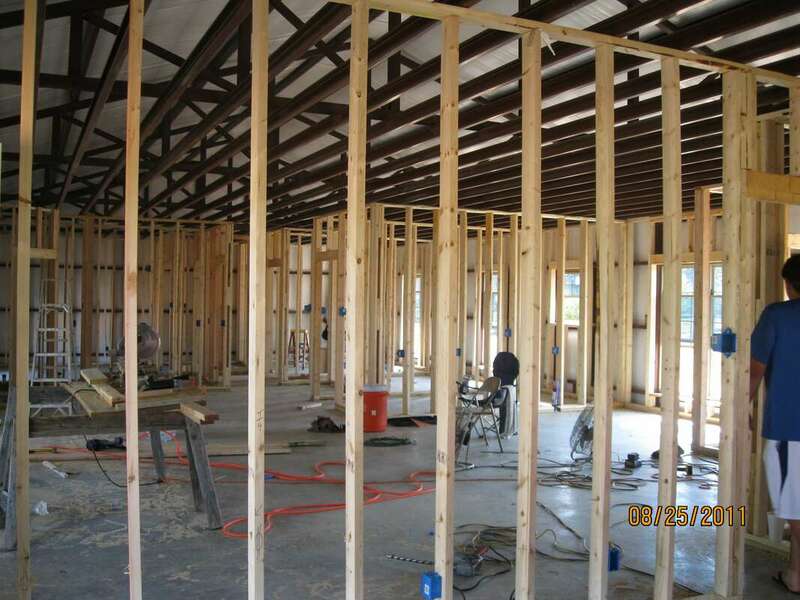 I mentioned above, the steel framing for the interior ceiling height was designed so that I could buy wood studs that required no cutting to build the interior walls. 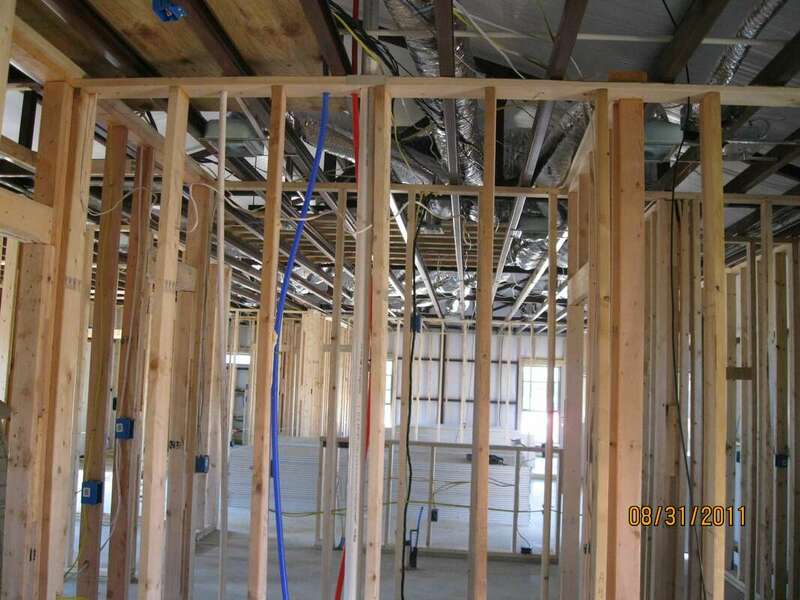 The interior walls were able to be stood right up to create a 9 foot flat ceiling height throughout. I used 104-5/8" studs with a single bottom plate and a single top plate. This allowed the walls to be secured directly to the horizontal steel C perlins that sheetrock for the ceiling would attach directly to. 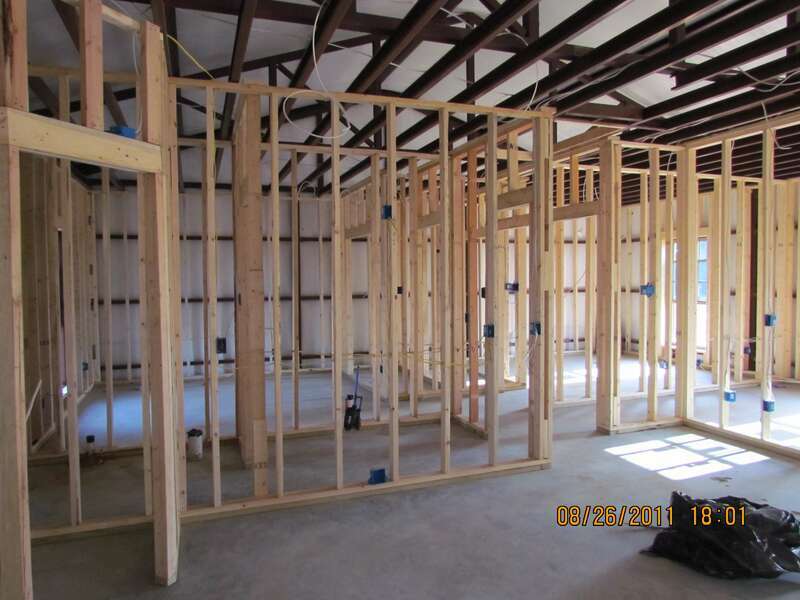 The interior framing went very fast, about four days. 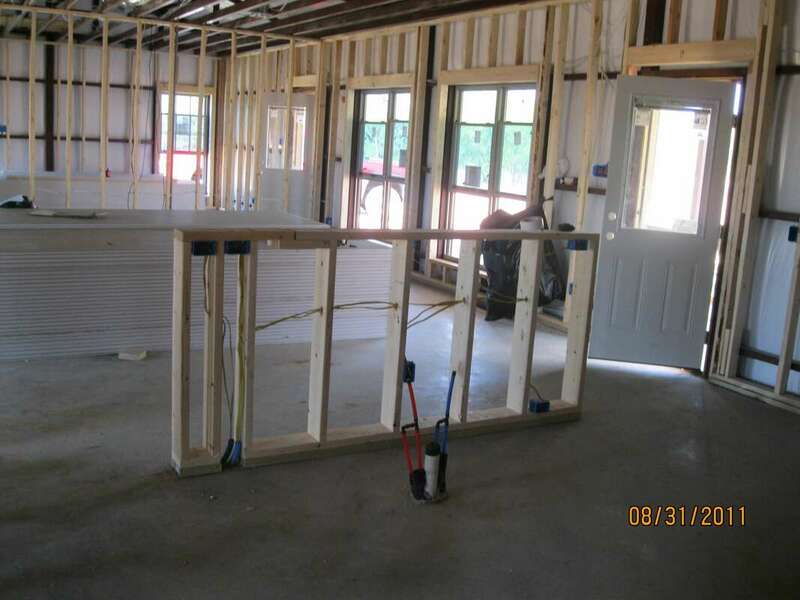 The 4 inch steel C perlins framed out each of the doors and windows, so we simply framed the wood flush with the steel C perlins. This gave us deeper than normal window insets and ultimately window sills. The window and door insets look about like a stick built house that has 2x6 wall framing. 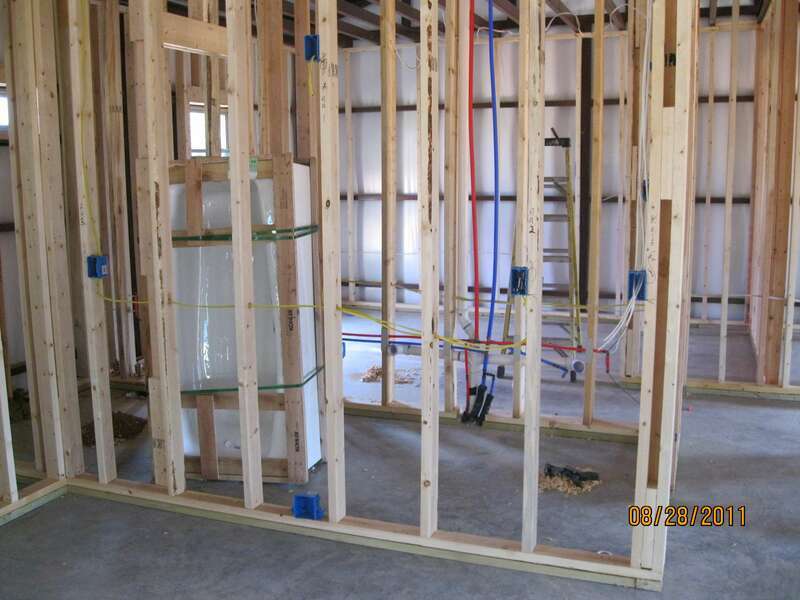 The electrician and plumber got to work on the top-out phase and the HVAC contractor got their system roughed-in. After the metal building shell is done you are completely dried in, so weather doesn't play a role at that point. You can take as much time as you need in completing the interior. 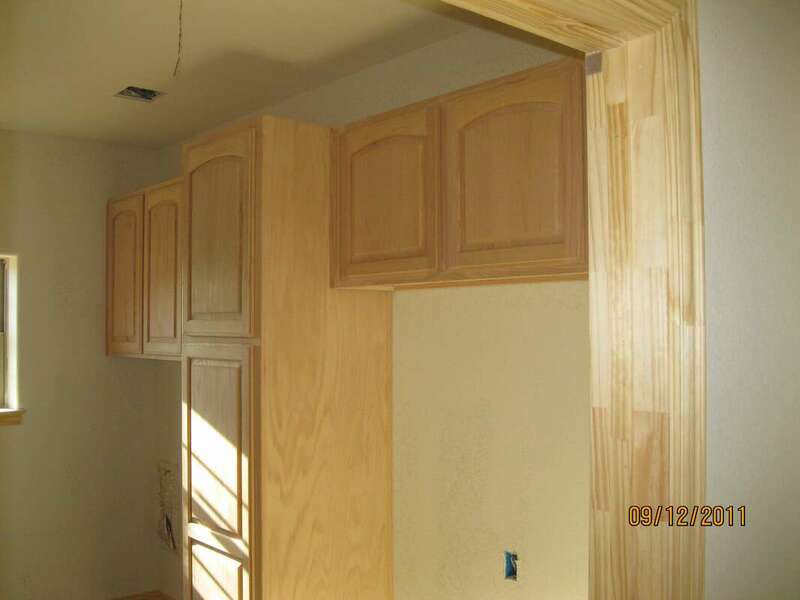 This is a huge advantage if you plan to do a lot of the interior work yourself. I've even heard of people finishing one section of the interior and moving in while still continuing to work on the rest of the house. The electric co-op that serves our area was very responsive in getting power service installed. They had to set one new pole to string their power lines from the main lines running along the far side our property. 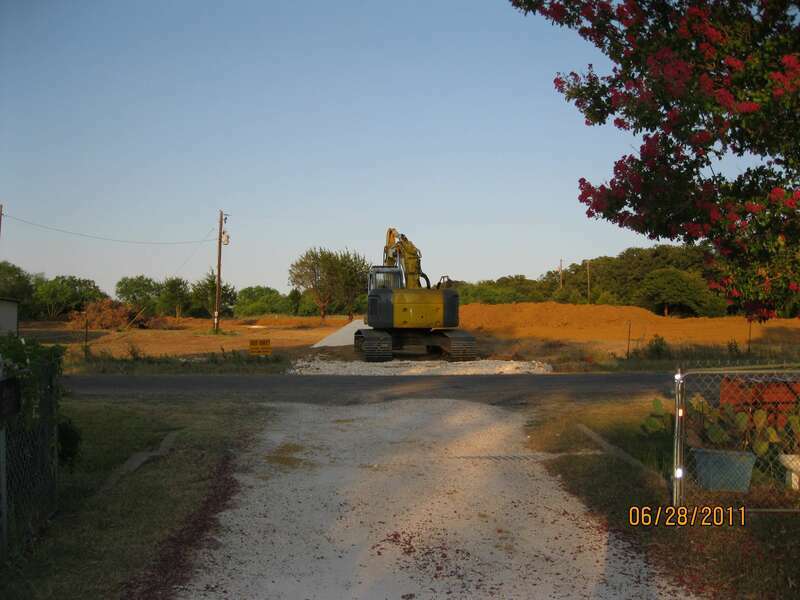 I opted to pay $750 to have them run the line underground from the pole at my property line to the house meter base. They wouldn't have charged anything for an overheard wire, but I preferred not to have one. 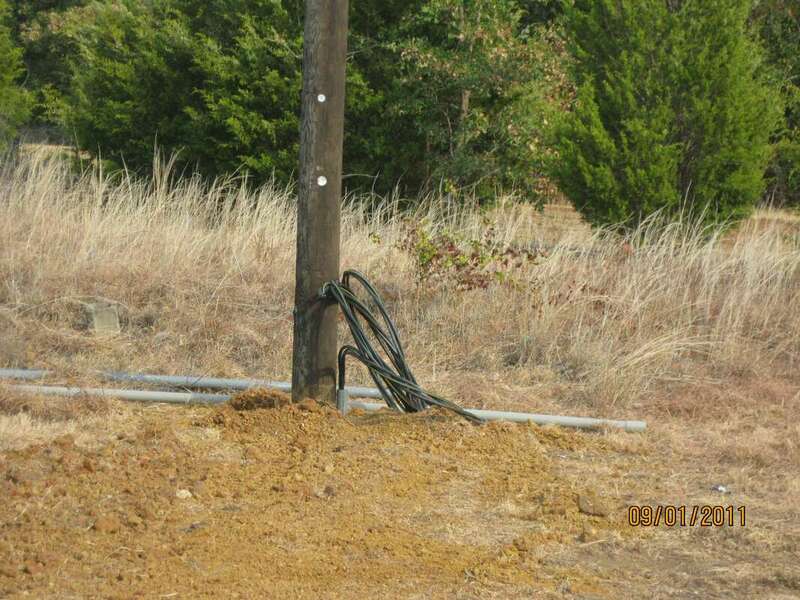 Some electric utilities charge for bringing service to your property and can also have a very long lead time to complete the work. We were fortunate that our co-op electric provider doesn't charge anything for extending a basic connection to their grid and the timeline to complete the connection wasn't very long. On the other hand our co-op water company charged a standard $1,000 just for the water tap to be installed. 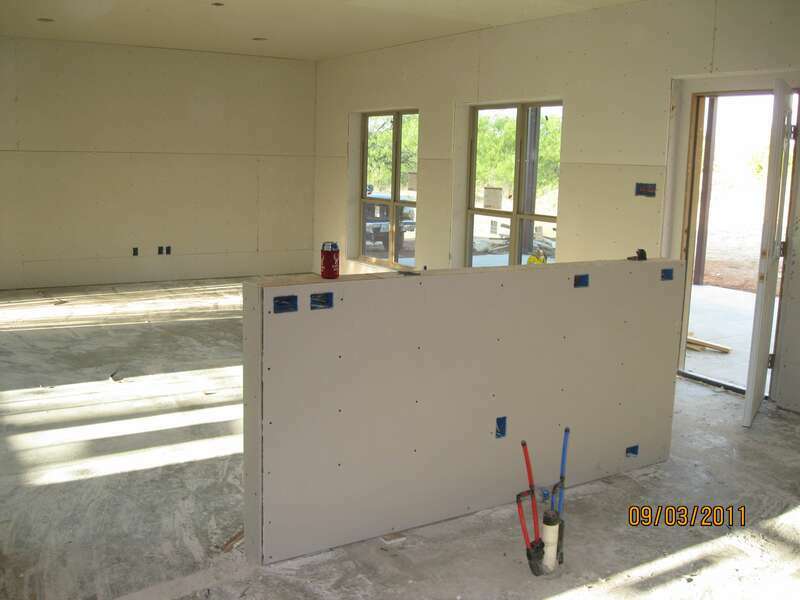 Texas Barndominium Drywall installation and Interior Finishing! 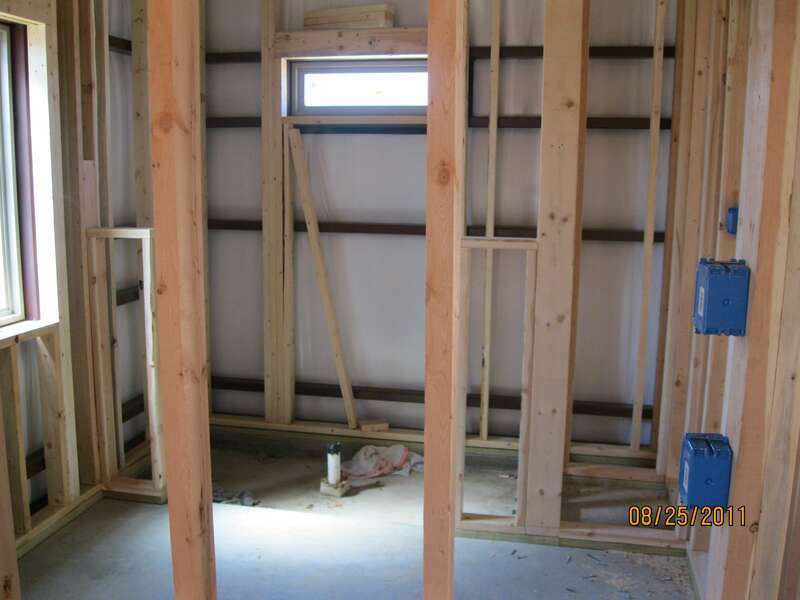 Within a couple of days of finishing the plumbing and electrical details the sheetrock was being installed. 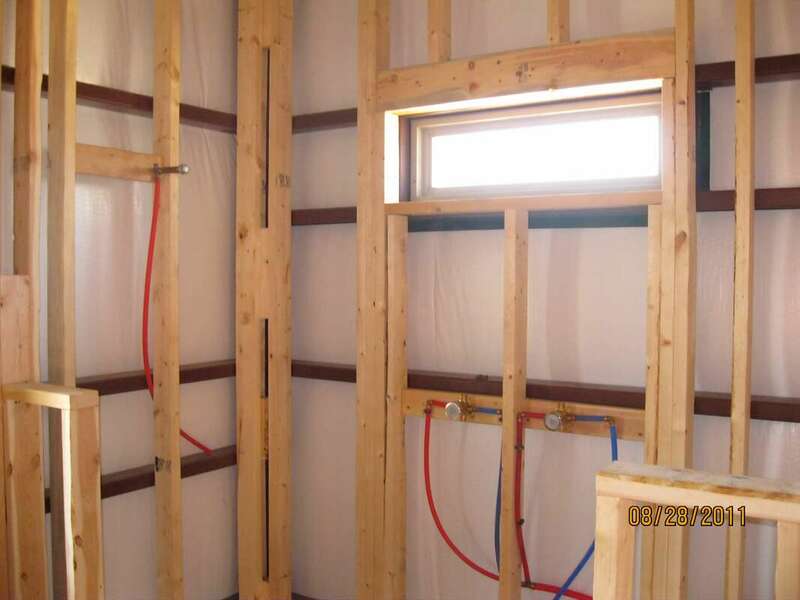 They did a great job sealing all joints on the interior wood framing and they also installed all of the interior batt insulation in the wood framing. 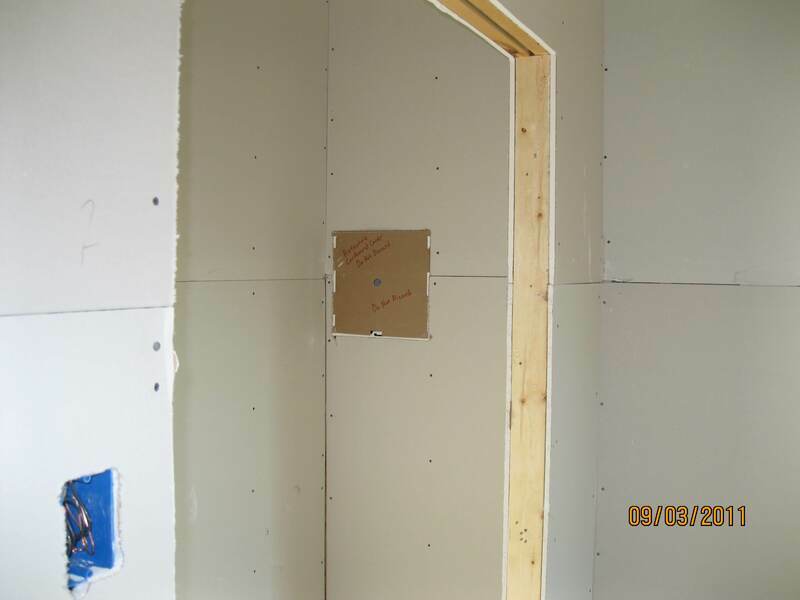 We batt insulated all of the exterior walls and the adjoining walls for bedrooms and bathrooms just for sound dampening. 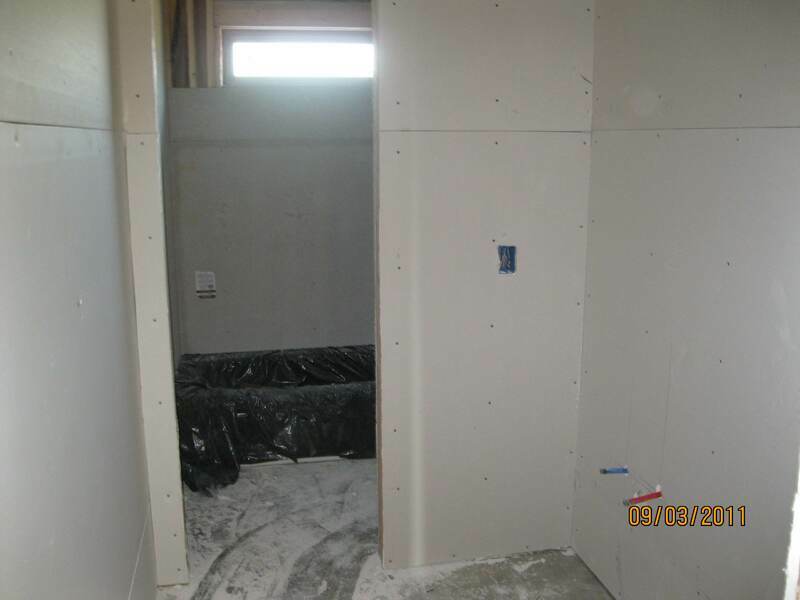 The drywall finishing was pretty straight forward with a splatter drag texture finish. 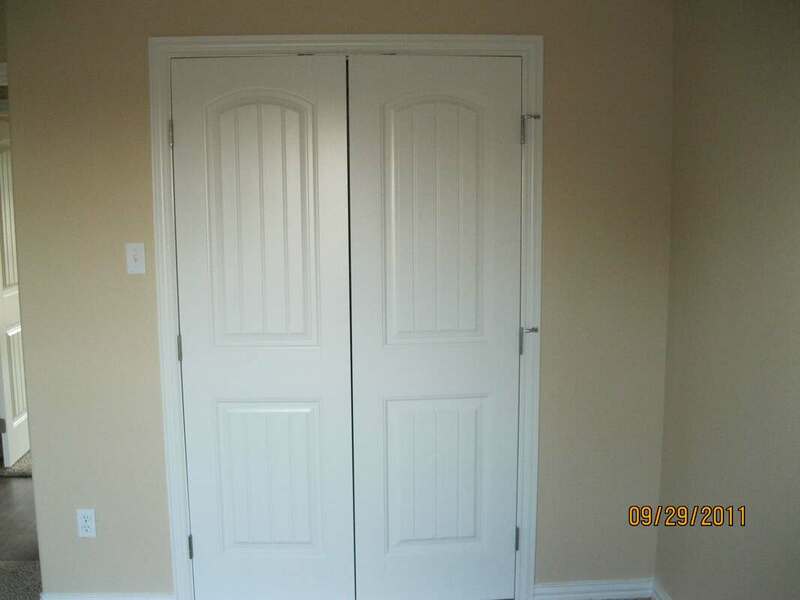 We did opt to utilize bull nose corner edging everywhere, which gives all of the corners a nice rounded look. I had ordered all of the custom cabinetry as soon as the interior walls were studded up. 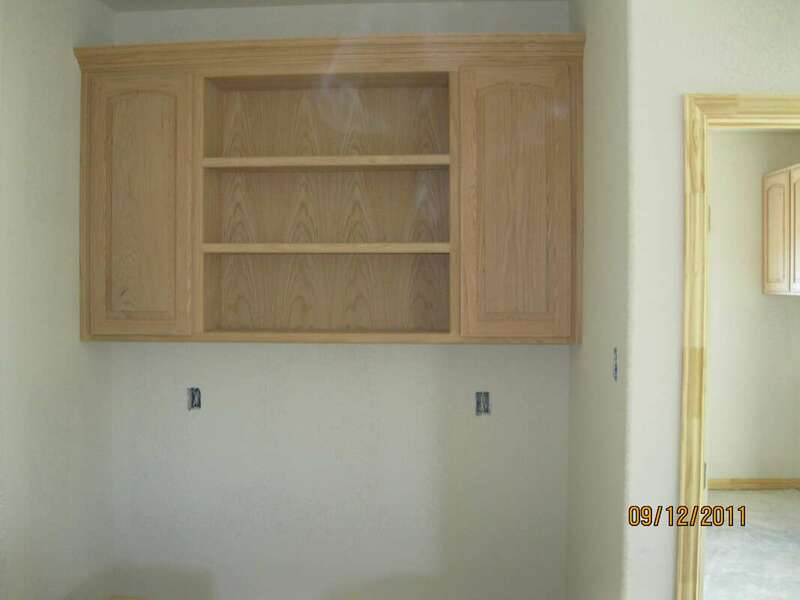 The cabinet company did a great job and had them delivered and installed within a few days of the sheetrock, tape, bed, and texture being completed. 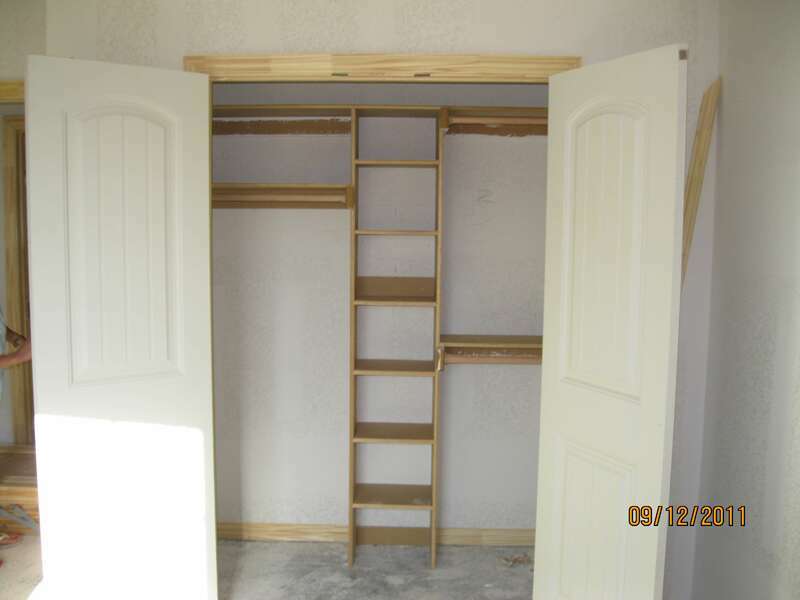 My trim carpenter got to work installing all of the moldings, trim and custom built-ins like closet organization and some shelving in the utility room. My tile guy was ready to start so they went ahead and began the master shower tile work while the painters simultaneously got started. 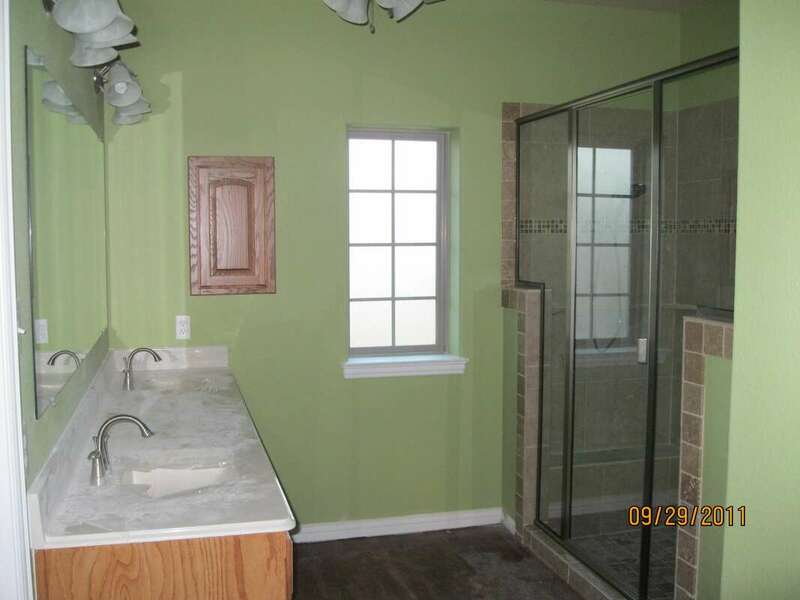 The tile guy took a day off when the painters needed in the master bathroom and then he was back at it. 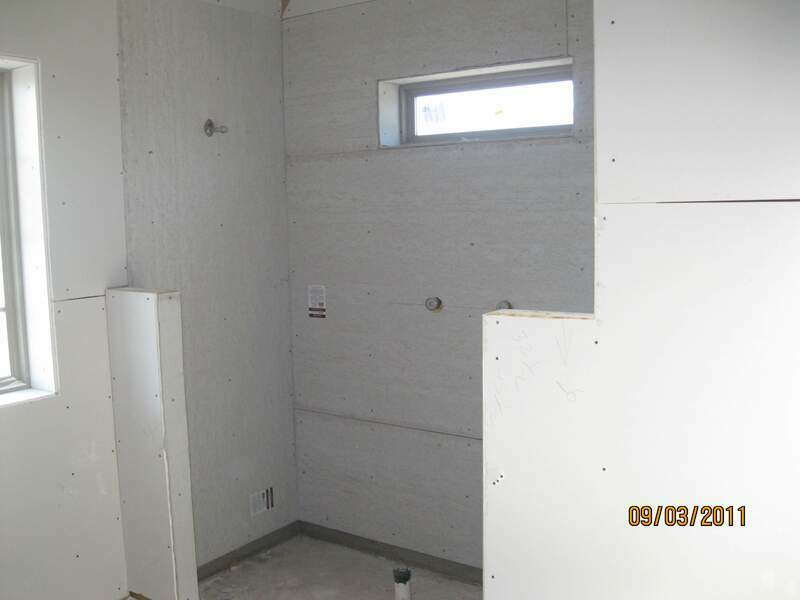 Now the bathroom counter tops went in and the master shower tile work was complete. I was then able to get the glass shower enclosure put in and the vanity mirrors installed in both bathrooms by the same glass guys. We went back and trimmed around the mirrors in the bathrooms so they looked framed. 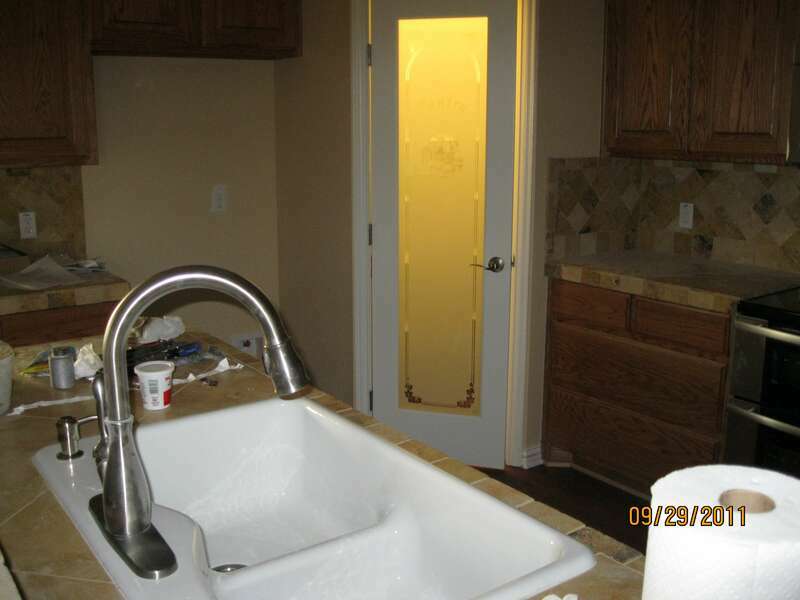 We went with cultured marble counter tops with dual integrated sinks in both bathrooms. ​We saw a display of tiled kitchen counter tops at a tile supplier. 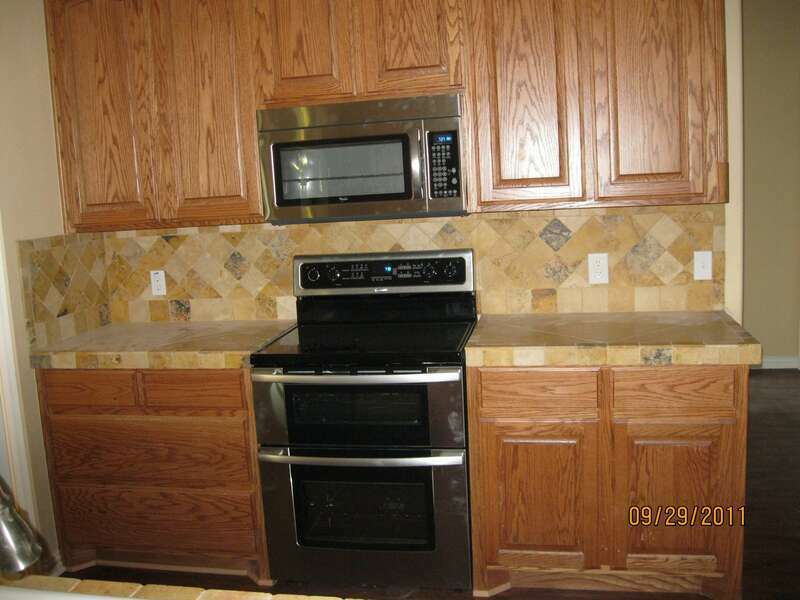 We ended up doing the tiled kitchen counters after asking our tile guy what he would charge to do it. 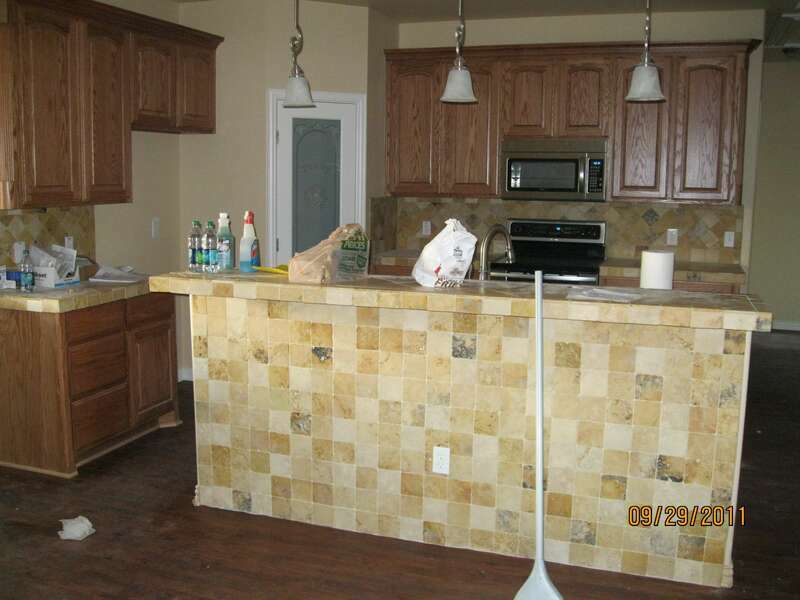 It was less to tile them than even the laminate counter top bid I had. Tile was still going in a few places when the electrician, plumber and HVAC guys returned to work on their fixture installation. Tile work finished up and then came the flooring. We used a glue down vinyl plank that looks like wood in much of the house. We've had many people through the years comment on how they love our wood floors. They are always shocked when I tell them it is very inexpensive vinyl. The bedrooms and closets got carpet. 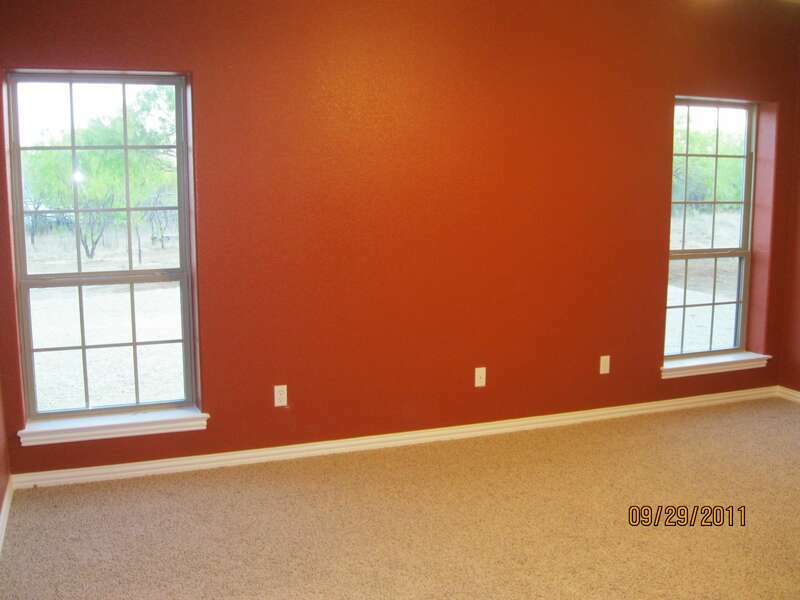 We've often wished we would have just done the entire house in the vinyl flooring and skipped carpet. 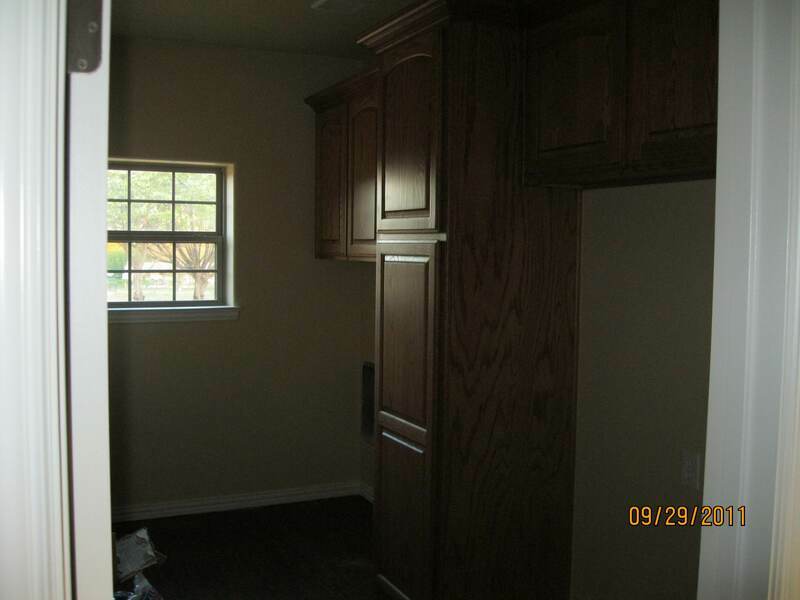 The electrician returned to install the appliances and test everything. HVAC guys came back out to start up and test the units. I went back around the baseboards that surround the vinyl flooring and installed 1/4 round at the bottom to make it flush with the flooring. 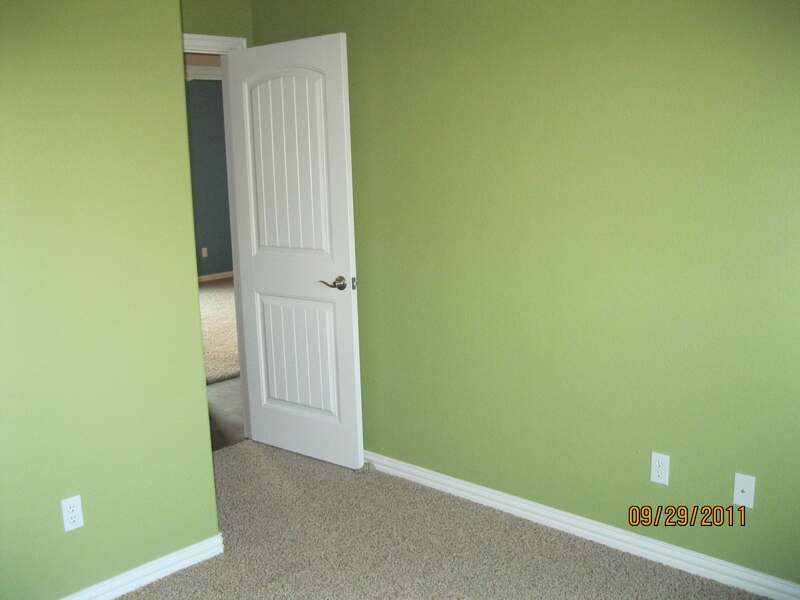 The painters were back in to do all of their touch up and painted the 1/4 round I had added on the baseboards. 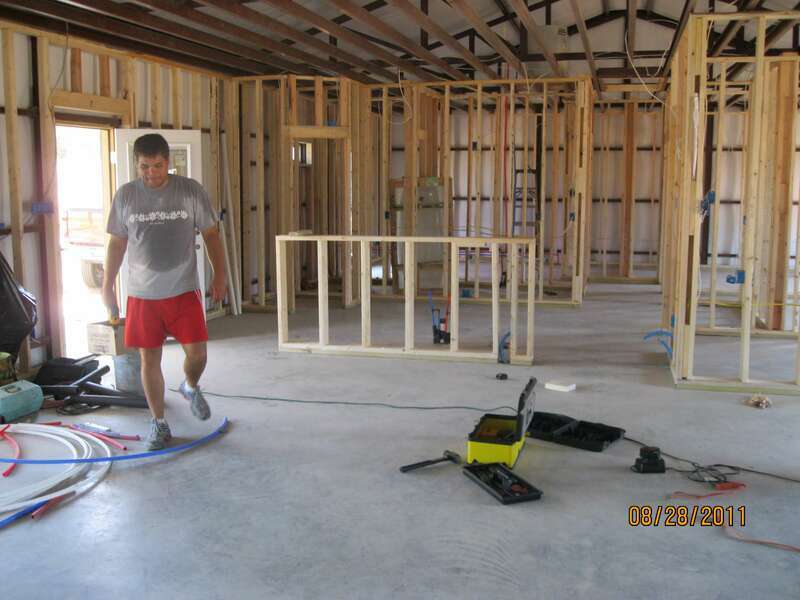 The drywall guys also came back to blow in the R40 insulation in the attic. 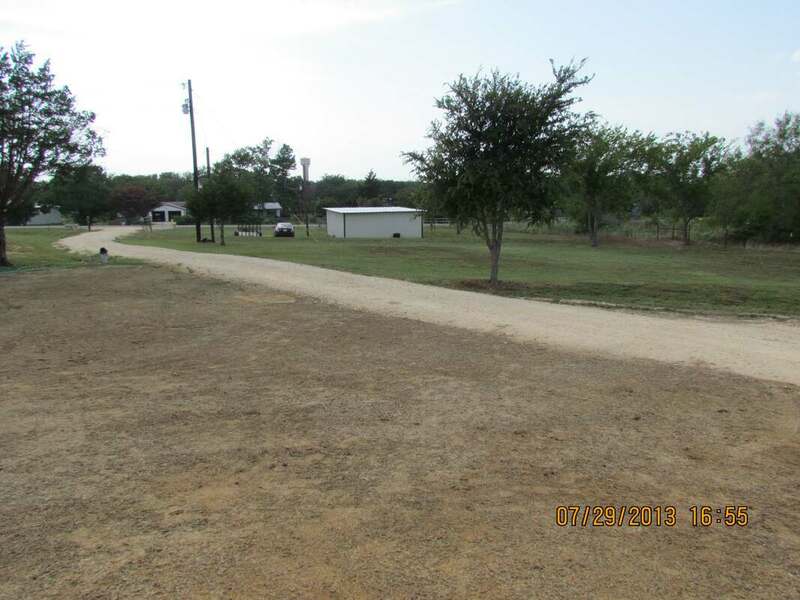 I wanted to have the ability to hook up an RV outside, so we put in a 50 amp plug and sewer discharge pipe on the driveway side of the house. The other electrical component planned for was a conduit ran in the foundation for a ground stub 220 volt electrical circuit to run a hot tub on the back patio. 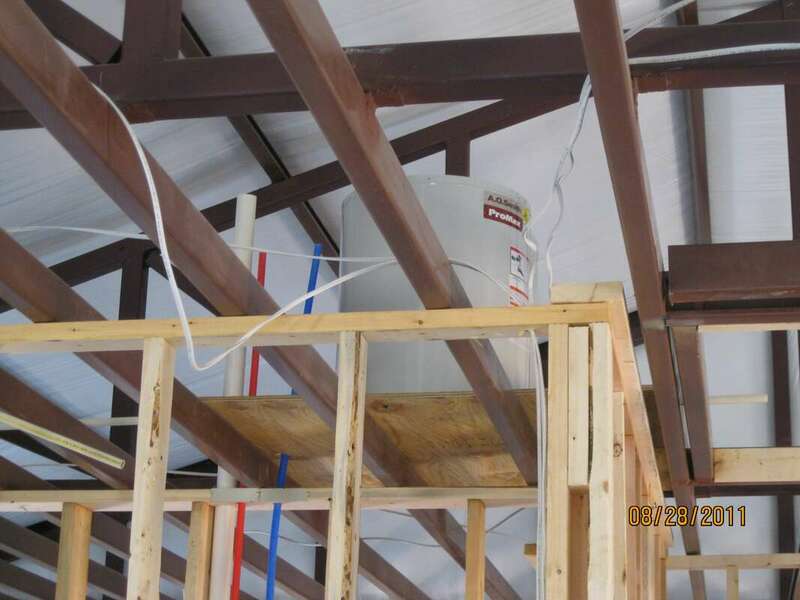 Because our barndominium house is so efficient, we only needed a 2 ton HVAC unit with heat pump. With that I can easily cool the house to 65 degrees on 100 plus degree days. ​During the time we built compact fluorescent lighting was the norm, so all of our light bulbs were pretty energy efficient in comparison to old incandescent type. We aren't very conservative with our electricity use. We keep the house about 70 degrees year round, we have two electric tank hot water heaters, and the hot tub on the back porch is always hot at 104 degrees. We have tons of electric items plugged in and we have outside lights that come on from dark to daylight. 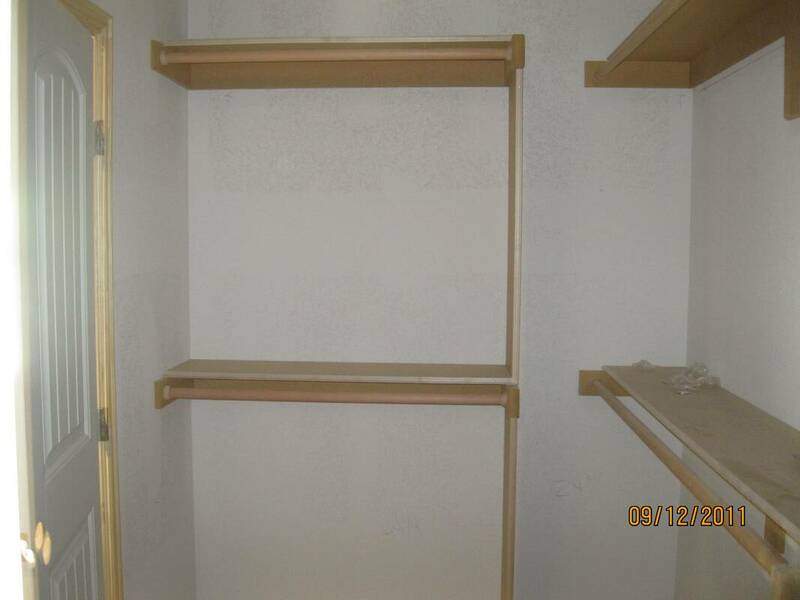 We also have a second full size refrigerator and a separate full size freezer in the utility room. ​Our average electric bill the first few years was $150 a month. Electric rates have gone up over the years and we have found more cool things to plug in, but we are still under $200 a month on our average billing. Moving Day! 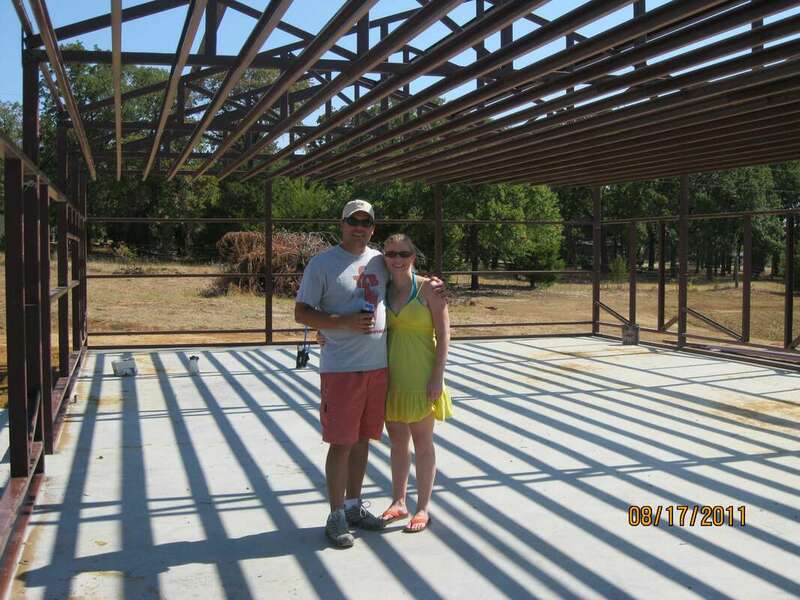 Our new Barndominium Metal Building Home and the months following! Moving day had arrived! 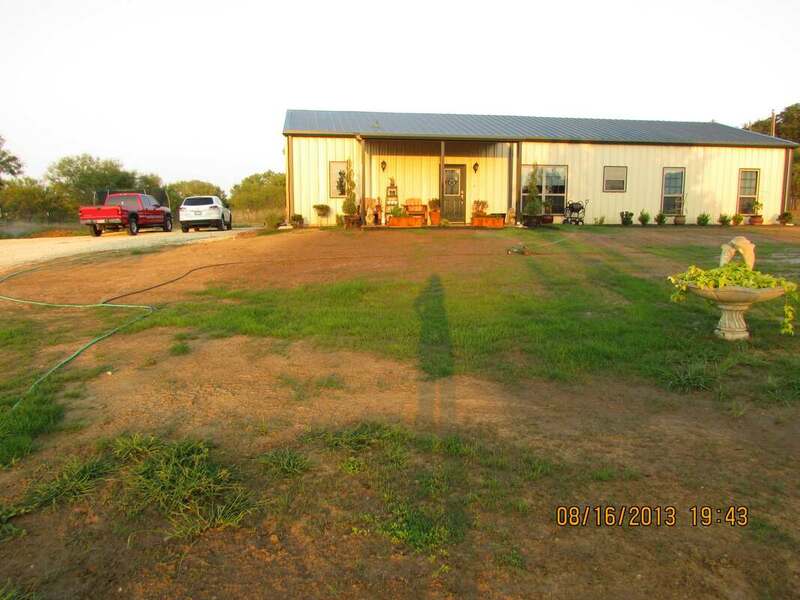 We basically had a finished home surrounded by over 2 acres of disturbed dirt. It was quite a mess for a while with the wind whipping up the dust. 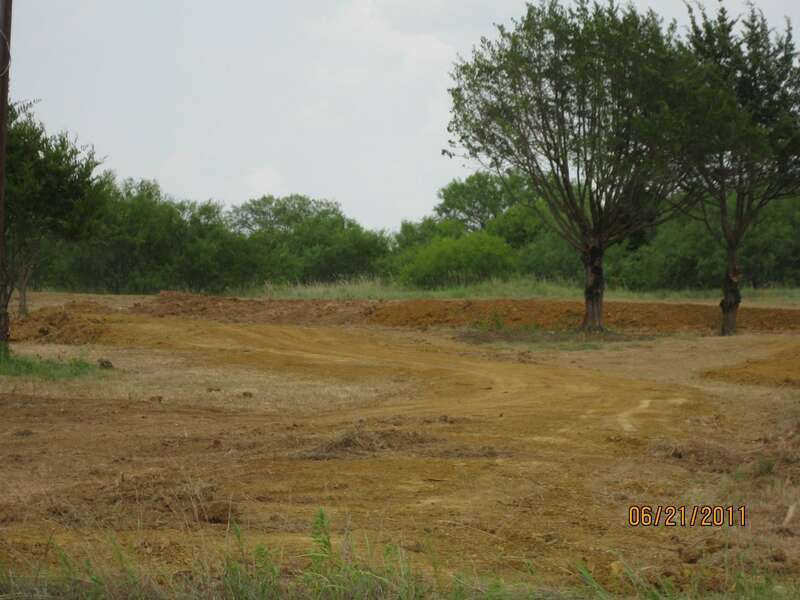 The road base gravel drive and parking area were already in from when we did the excavation. So we started unpacking and got settled in. The next spring we started projects outside. 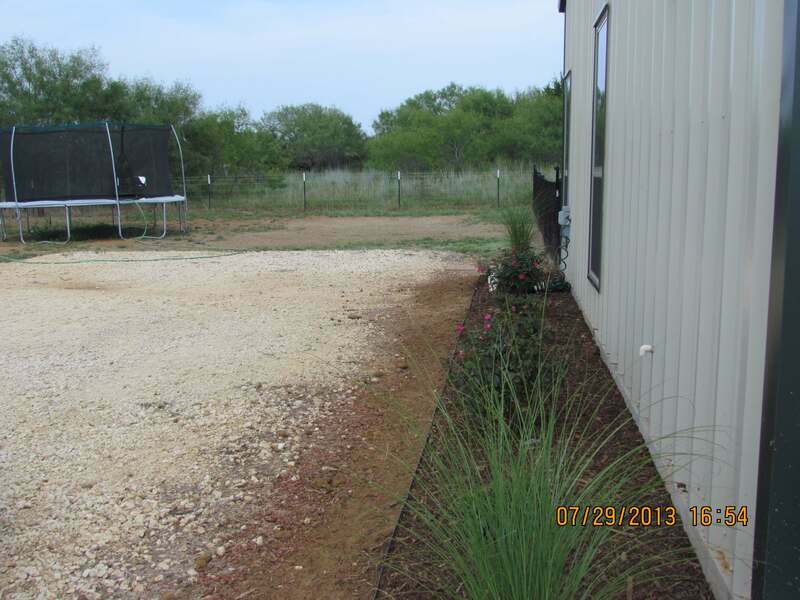 We installed a landscaping border and some landscaping plants on the front and driveway side of the house. 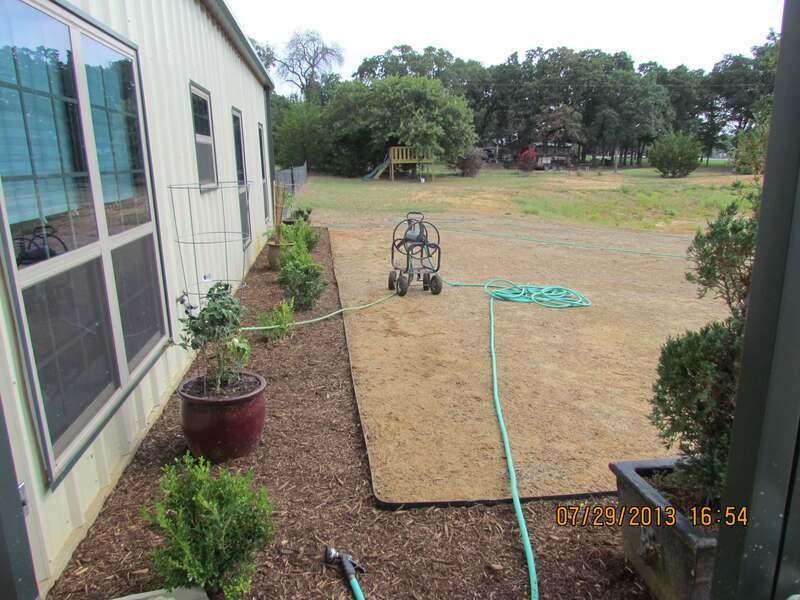 We also completed a regrade of the immediate yard and had hydro mulch grass seed applied, followed by a lot of watering for several weeks. 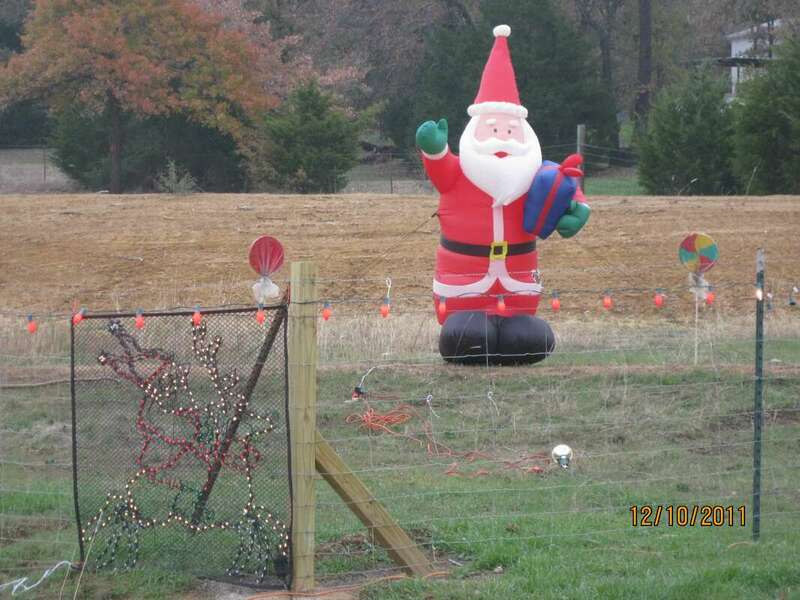 We placed some of the yard decorations we previously had and acquired a few new ones. 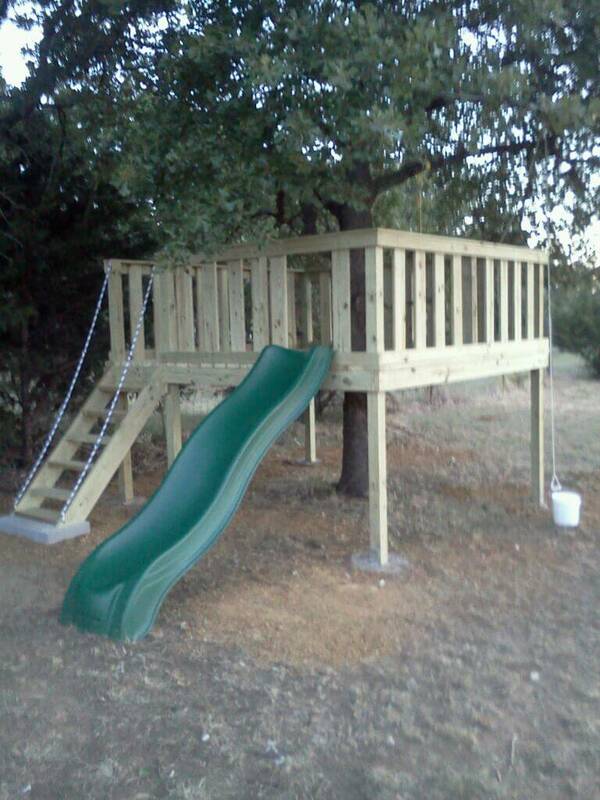 We also built the kids a tree fort with a slide and a covered frame for a swing to overlook the pond. 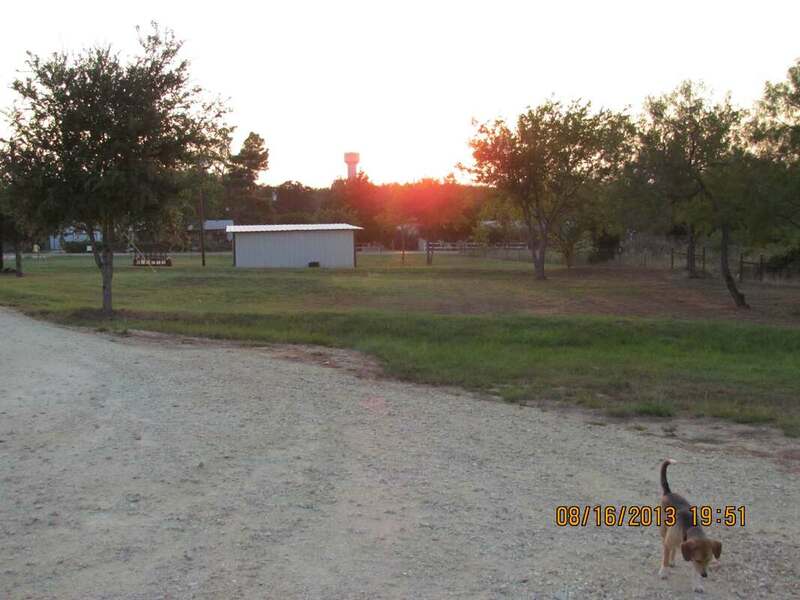 Life in our new Texas metal building barndominium home was now in full swing! I hope you enjoyed the presentation of our barndominium construction project and maybe learned something. If you are planning a similar construction project of your own we wish you an exciting adventure and much success ! Click here to check out our Home Improvement Projects! You can't over plan for your construction. 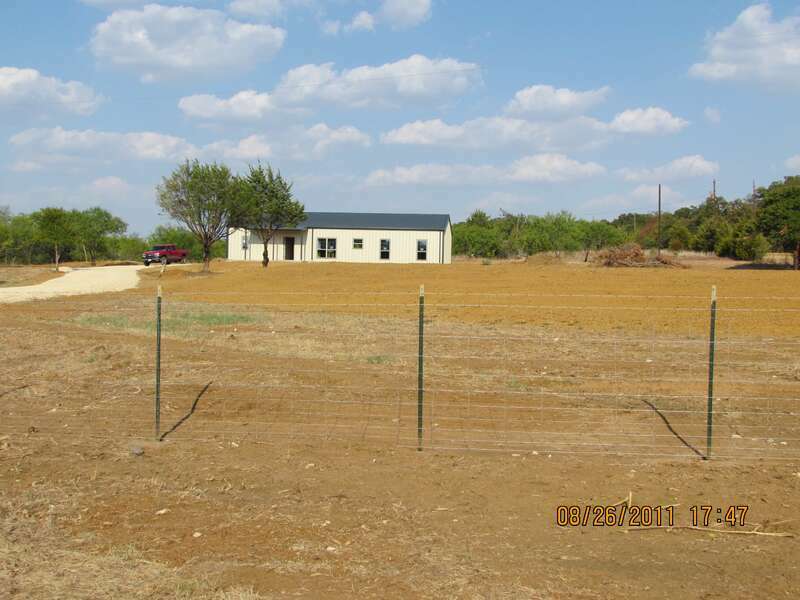 I started planning as soon as we decided to build our metal building barndominium home. I can't press upon you enough how important the planning process is. If you are going to act as your own general contractor for construction, every little detail rests on your responsibility. ​There will definitely be problems to solve during construction and they can be costly if you're not right on top of every detail. Most problems can be avoided with proper planning. If you know you aren't cut out for carrying the full weight of the project you might consider enlisting a general contractor or some sort of construction supervisor. 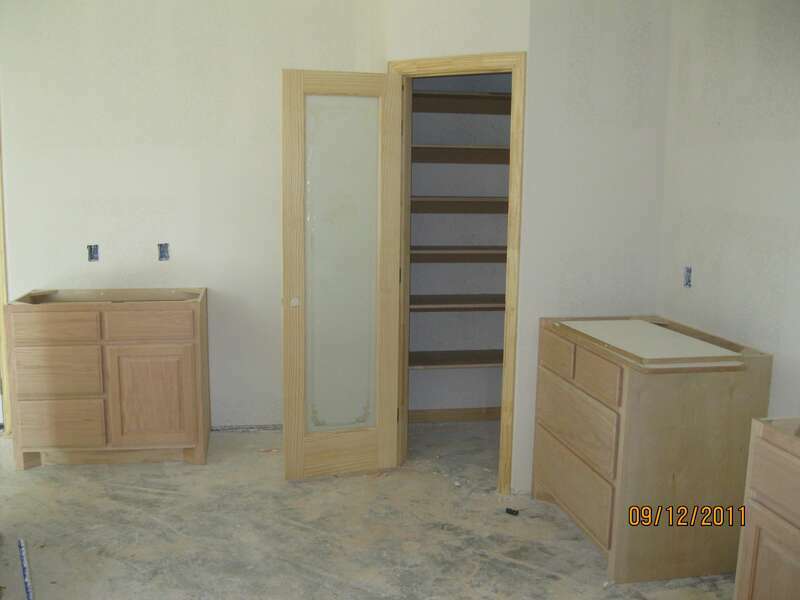 The professional assistance can cost up to 20% on top of the actual construction cost. That's a lot of money that could have been spent elsewhere, but be honest with yourself in deciding if you have the ability to be your own general contractor. Before you can get started with cost estimating you will need to have a quality set of plans. 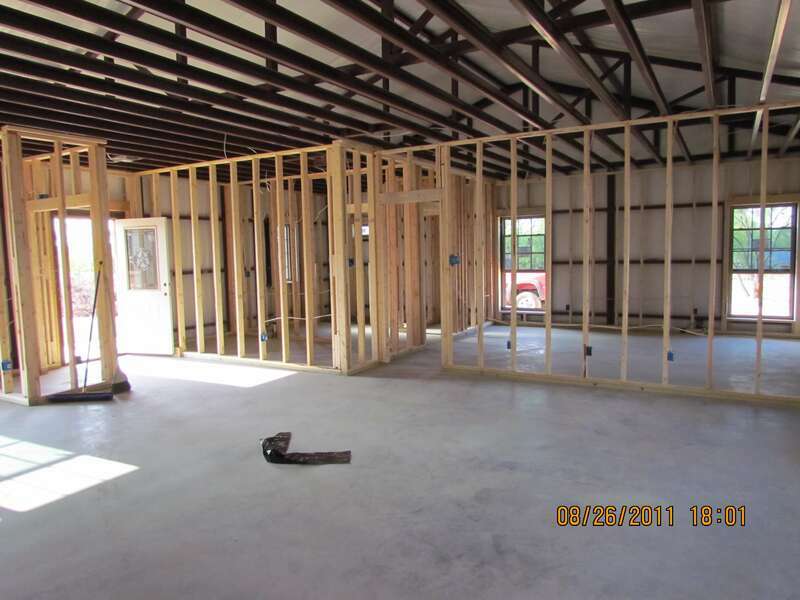 The more detail within the barndominium construction plans the easier estimating will be. One of the things I like to highlight for people new to building homes is don't forget you might want to sell it one day. 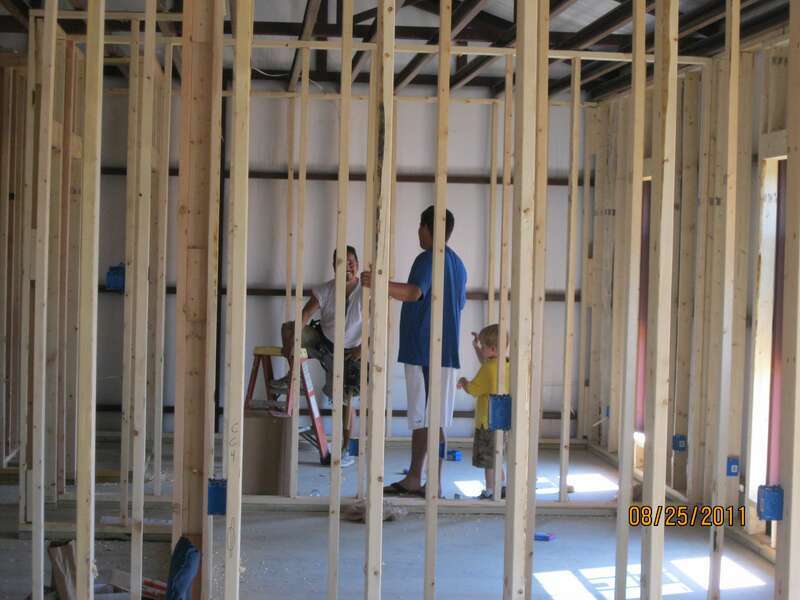 A lot of people think, or say, they are building their forever home. But according to data I found online, in the United States only 37% of homeowners live in their home for over 10 years. 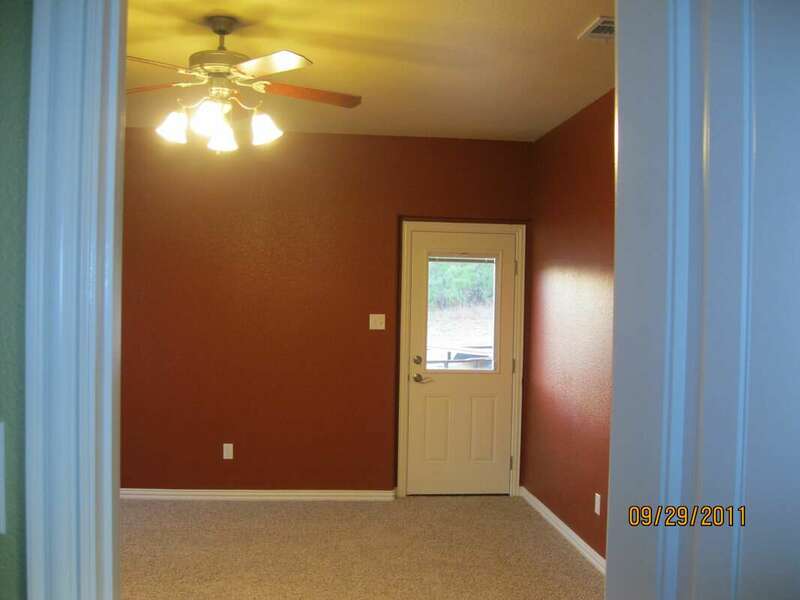 It's best not to build a floor plan that only suits you and no one else would ever appreciate. That said, the beauty of designing your own floor plan is you can make it just as you want. ​Search the web for a professional residential home designer in your area. 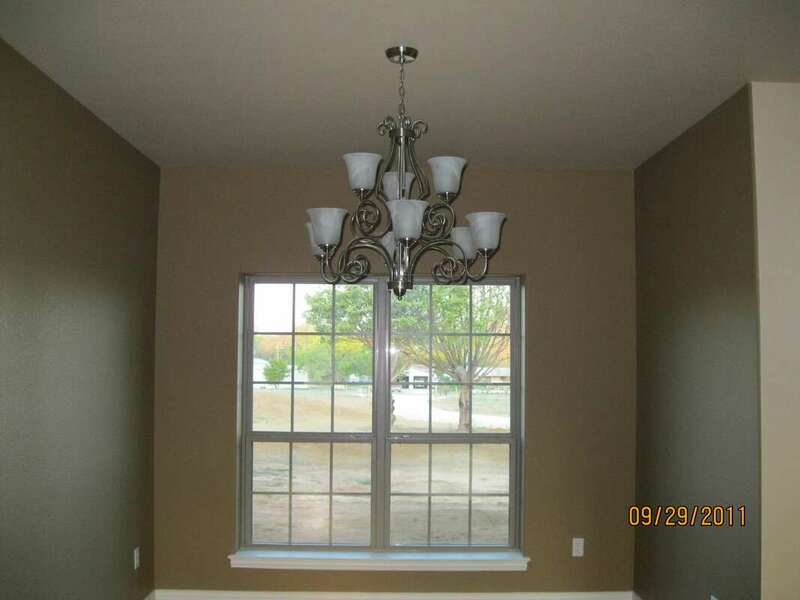 They will help you finalize your floor plan design and provide you with finished plans. 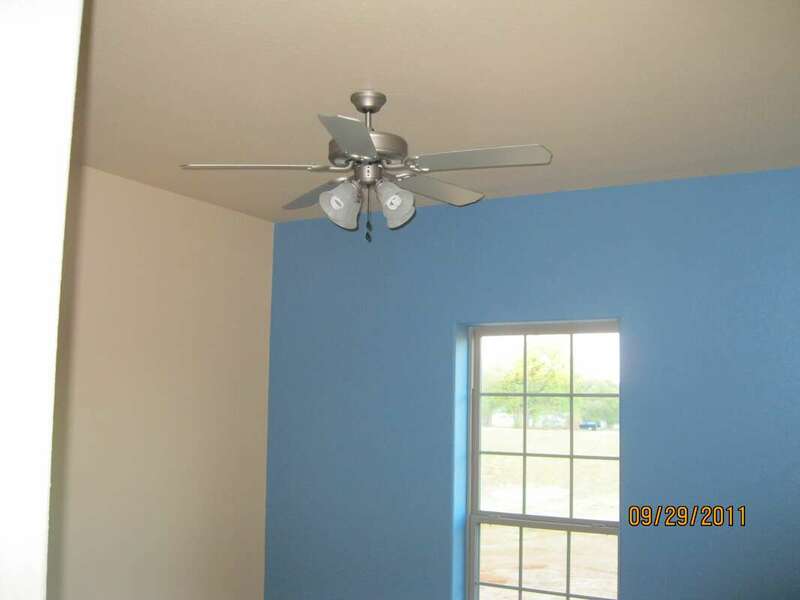 I personally wouldn't spend more than $1,000 for the floor plan design work. The work needed from them compared to designing an entire stick built home is a lot less. I was able to present my scaled sketches and have the needed plans finalized for $750. The sketched design I started with was also improved in a lot of ways with my professional designers input. It was money well spent and saved me from some problems that would have occurred that I hadn't thought about. The amount of detail you place into your plans is up to you, but be sure to consider all of your mechanical needs in your overall design (like hot water heater and HVAC placement). 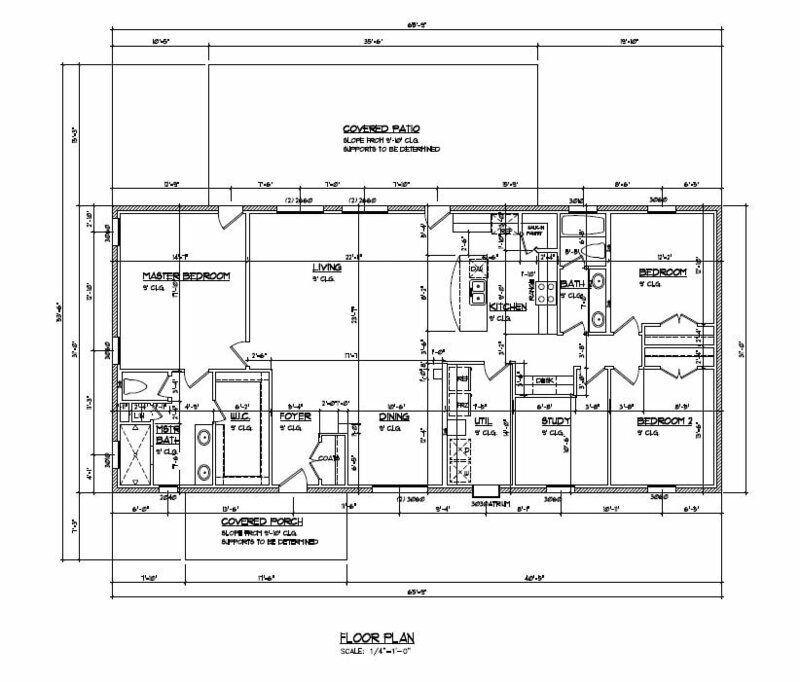 ​There are quite a few online services and software tools available today that you can use to design floor plans and construction plans. That could be a great option for some people. 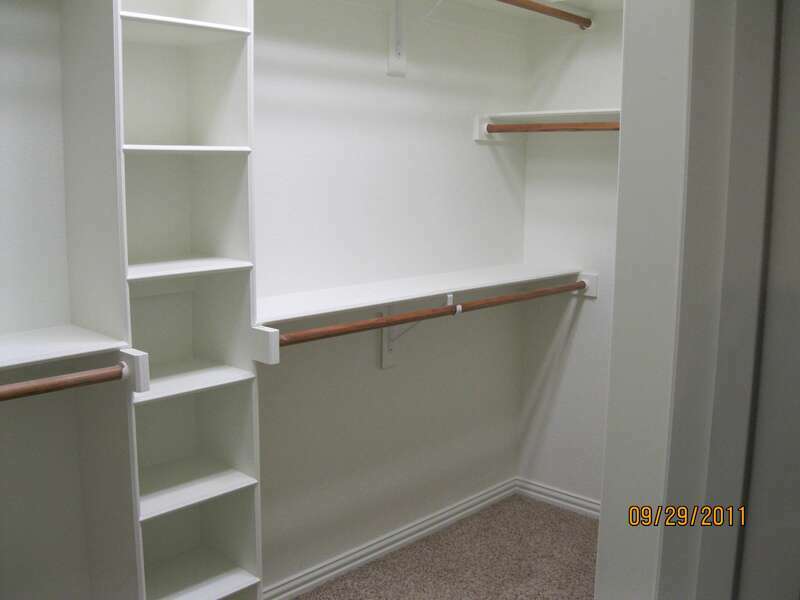 I would just be careful about the fact that you have to be the one to ensure your measurements are exact for construction standards. You also have to be sure you don't miss any details and that your room and various spaces are dimensions that make sense. 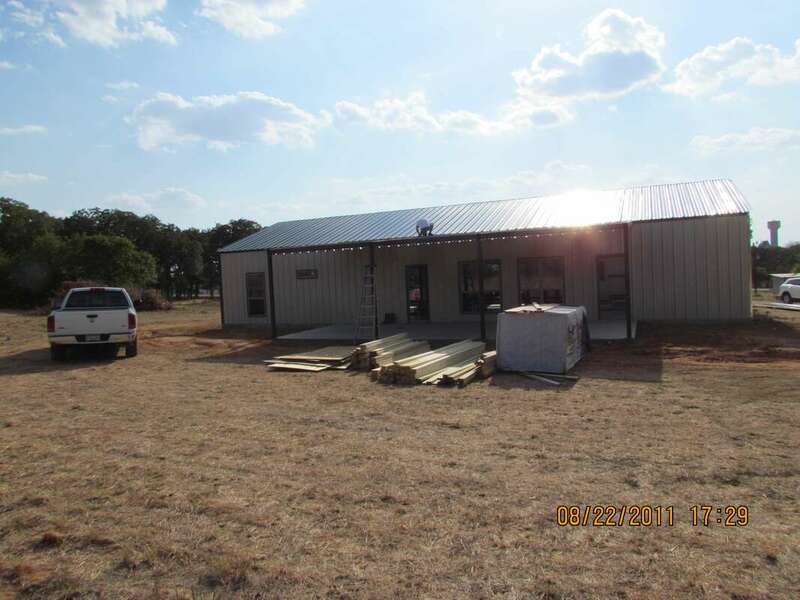 My custom metal building fabricator used the finalized floor plans to design the metal building utilizing CAD software. They provided the bid for the complete metal building and then I was able to move forward with the remainder of construction cost estimating. 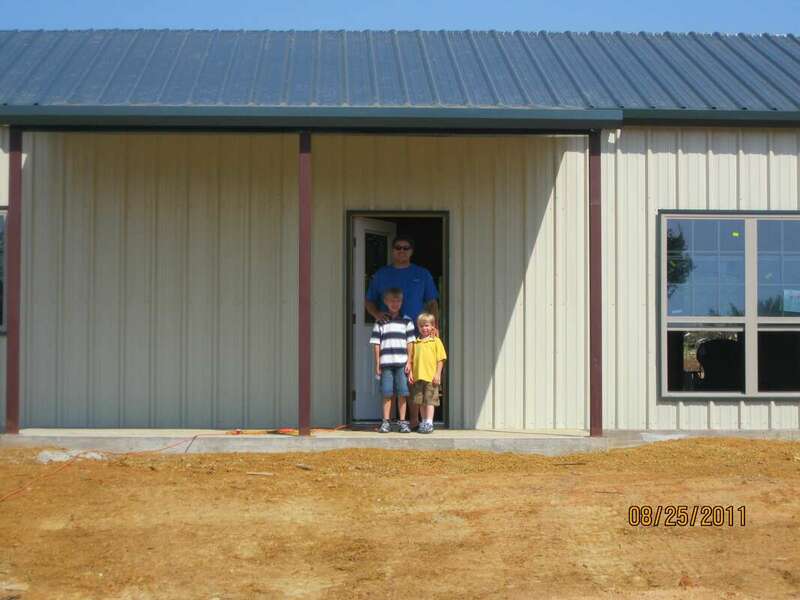 They only built the building, I had the concrete foundation completed and ready for them to do solely the metal building erection. ​Developing your cost estimate is the most crucial step in planning your Barndominium home construction project. 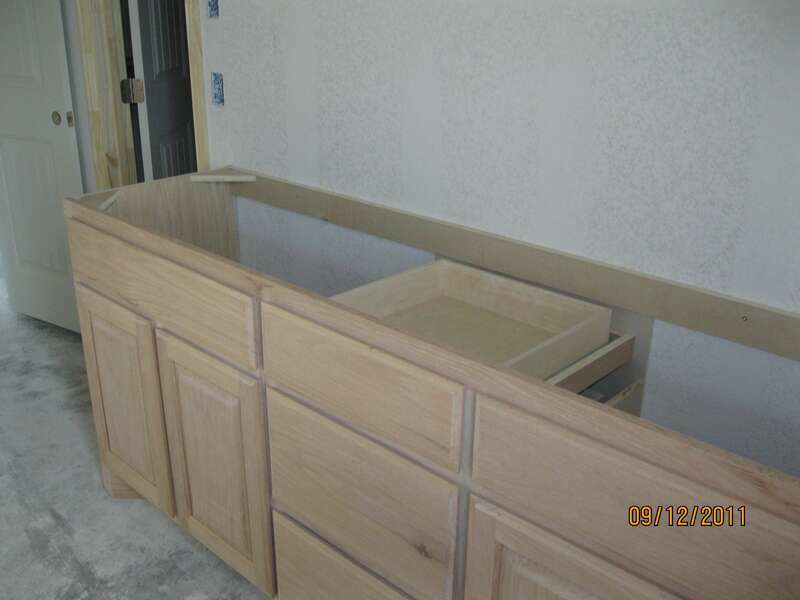 There are templates online that have all the components, or steps, of home building. 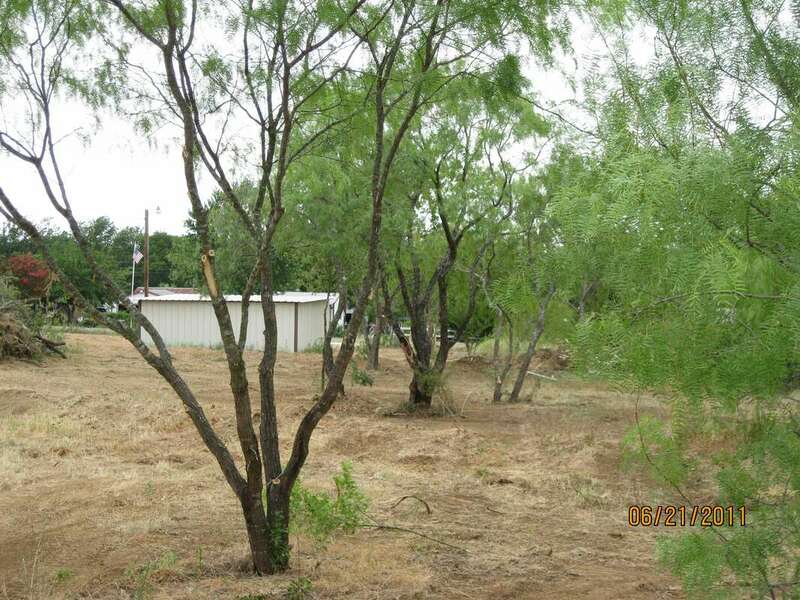 That is a good starting point to understand all that you need to estimate. Most of what you will find will be specific to stick and brick construction, so you will need to consider the differences in scope. ​The important part of estimating is that you have to cover every single penny that will be spent. There are a lot, I mean a whole lot of components that go into a home. You have to think of everything down to the door stops, towel hanging bars, and toilet paper roll holders. Also, make sure you have every component of your utilities considered (electric/water/sewer). ​If you think about a $100,000 budget, you only get to spend $1,000 a hundred times to complete every single component of your build. So be careful and don't shortcut the estimating. You want to have cost numbers and bids in hand from someone you feel comfortable with using on your project for every single component, both material suppliers and trade labor. A lot of the money to be spent doesn't happen until the final weeks of your barndominium construction. 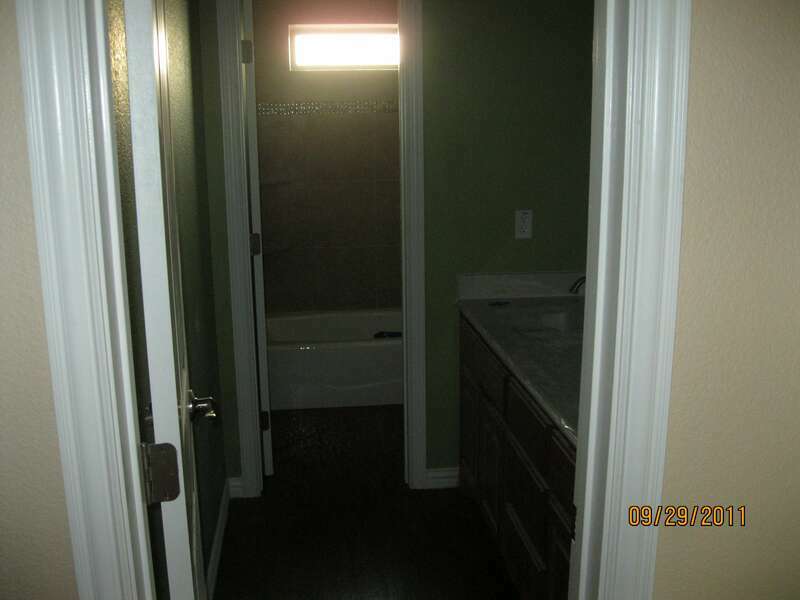 Things like tile work, counter tops, plumbing fixtures, lighting fixtures, and flooring add up very fast. All of these sort of items also have a major cost variable depending on the style and quality you select. You have to select the "exact" items beforehand and have your exact cost figured out. Just a hand full of the finish out items going over budget, because you later decide to upgrade, can blow your budget by 10's of thousands of dollars easy. 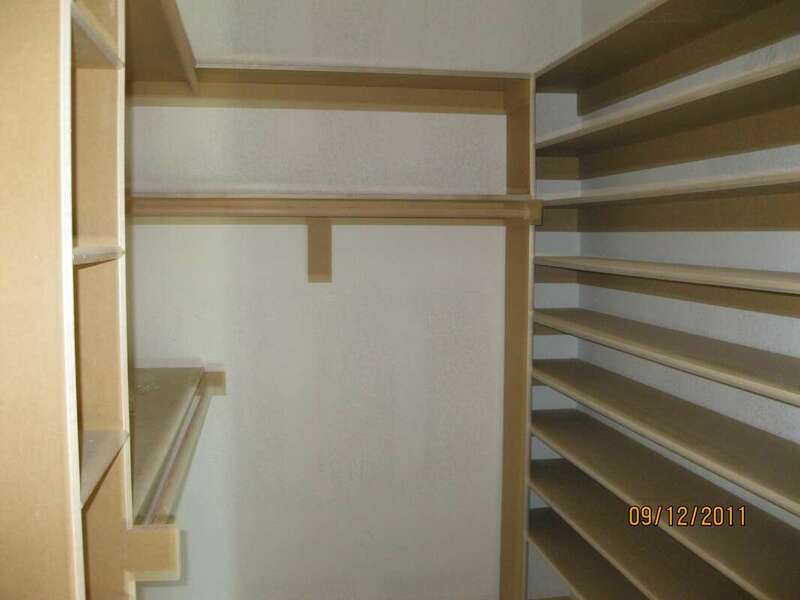 Pick out everything exact to be used and have your cost estimates and total budget spot on. Now it's time to scour the numbers. Double and triple check you have every cost considered. Run through every what-if scenario you can come up with and run everything by anyone you can find that has any construction knowledge. 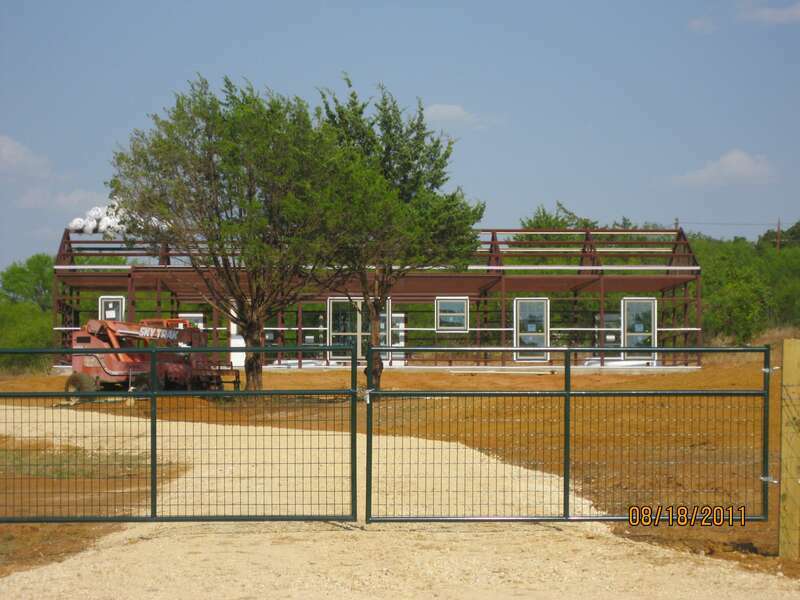 Once you feel certain you have every penny to be spent accounted for, and you can basically envision the finished project in your mind, you are ready to start building your metal building barndominium home!